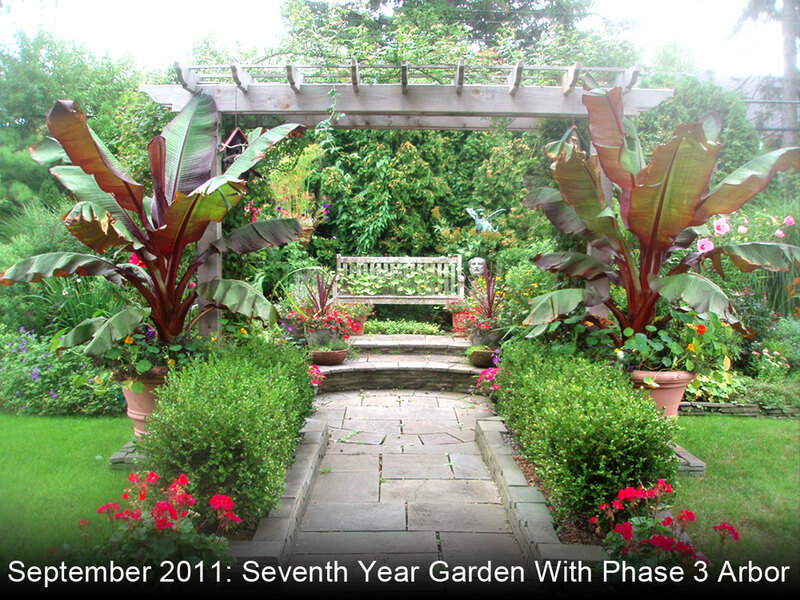 Take The English Gardener tours below! 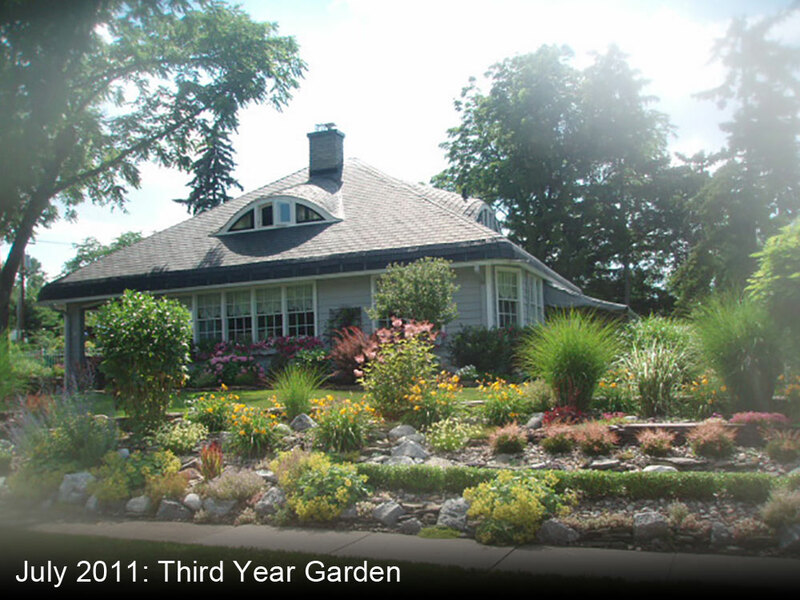 The front garden of this residence shows off every season with strong bones and wave after wave of color, but we’re featuring the back gardens where the owners relax. 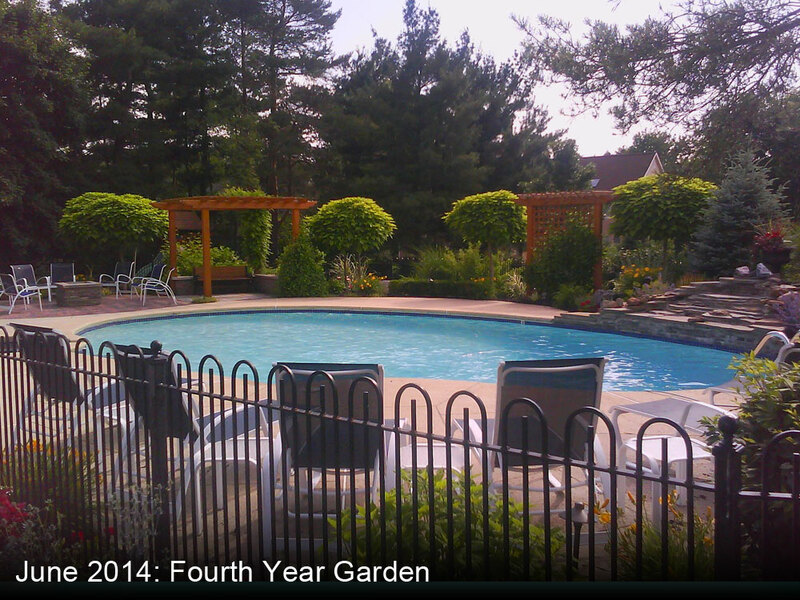 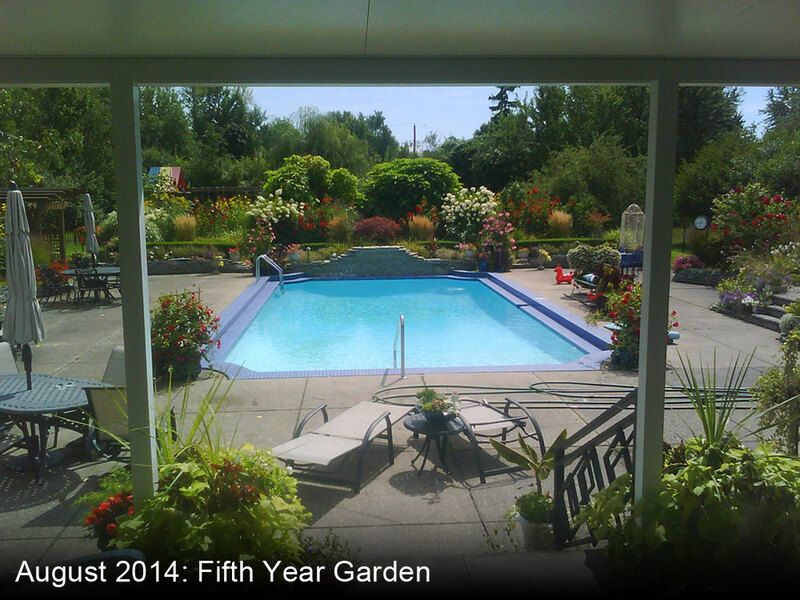 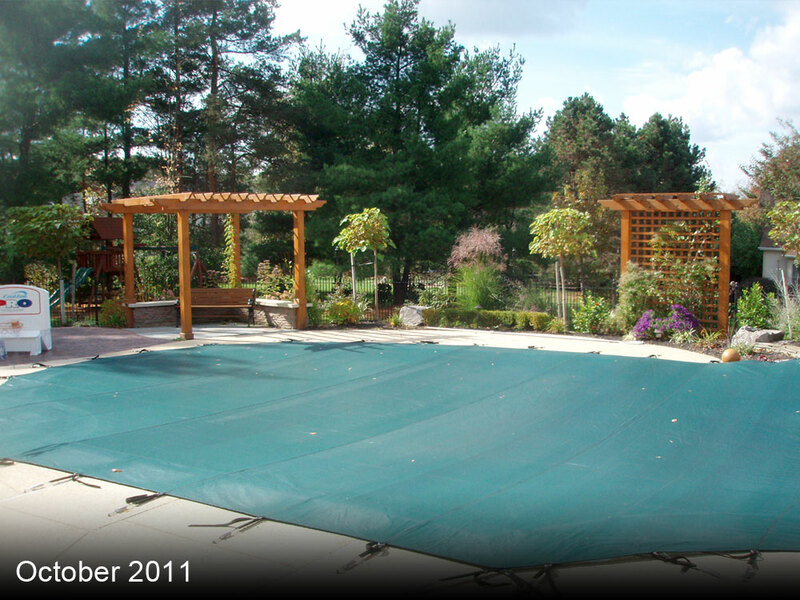 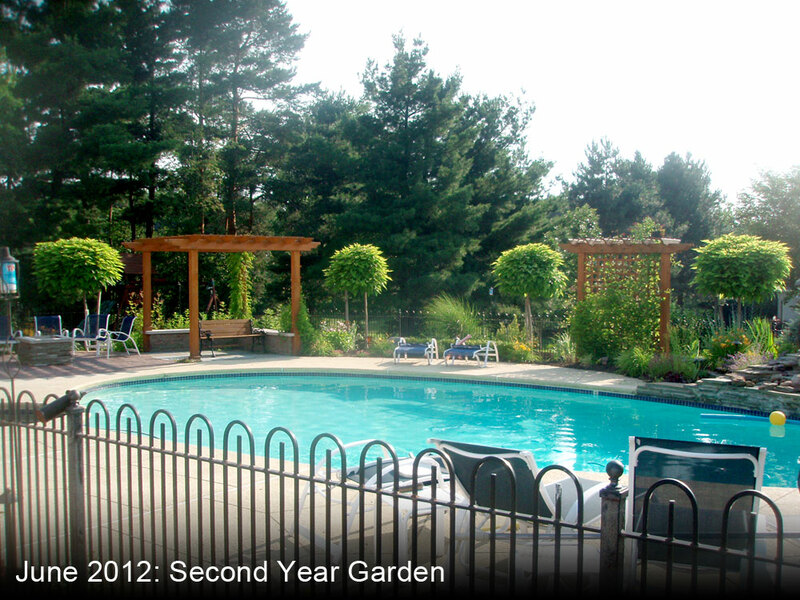 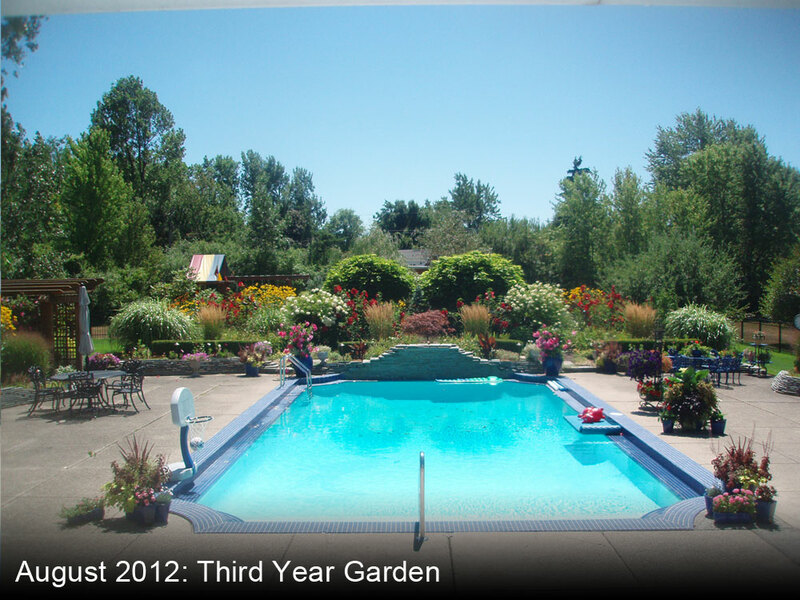 It has a pool and hot tub for grandchildren to enjoy as well as trampoline and playset. 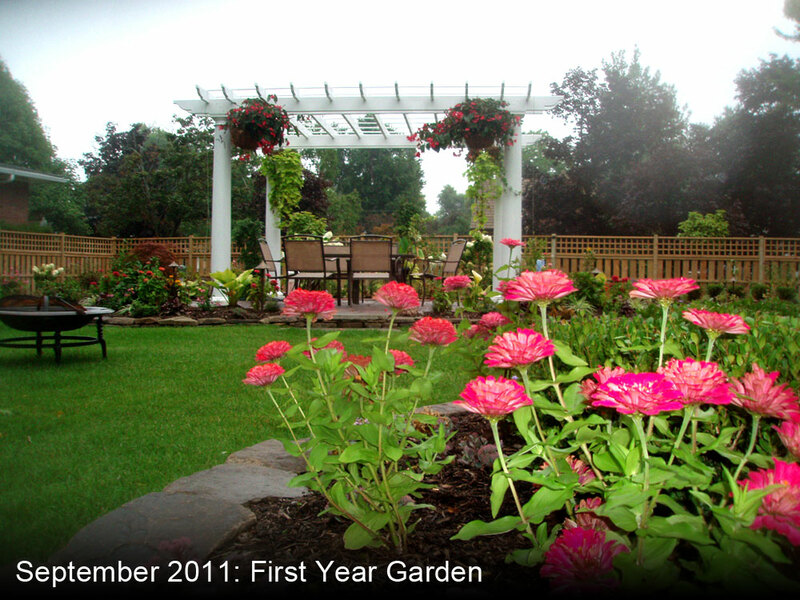 The sequence of blooms, and a climax in early August, correspond to the wedding ceremony that was hosted here on a beautiful night with amazing dining, flowers and ambiance with night lighting for 200 guests…it was a memorable night! 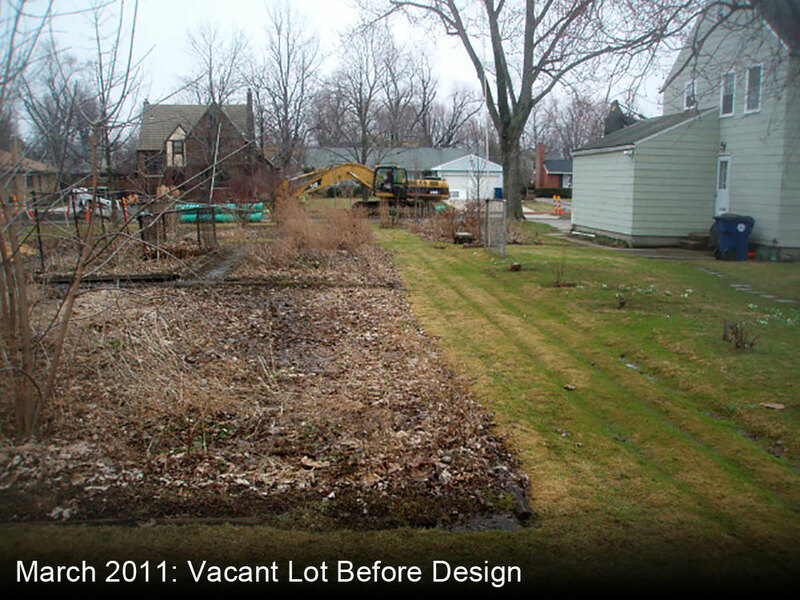 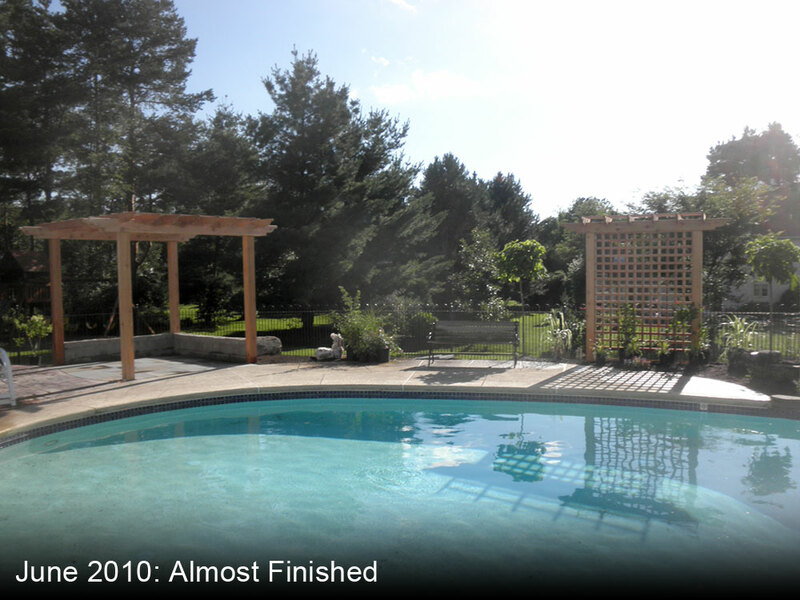 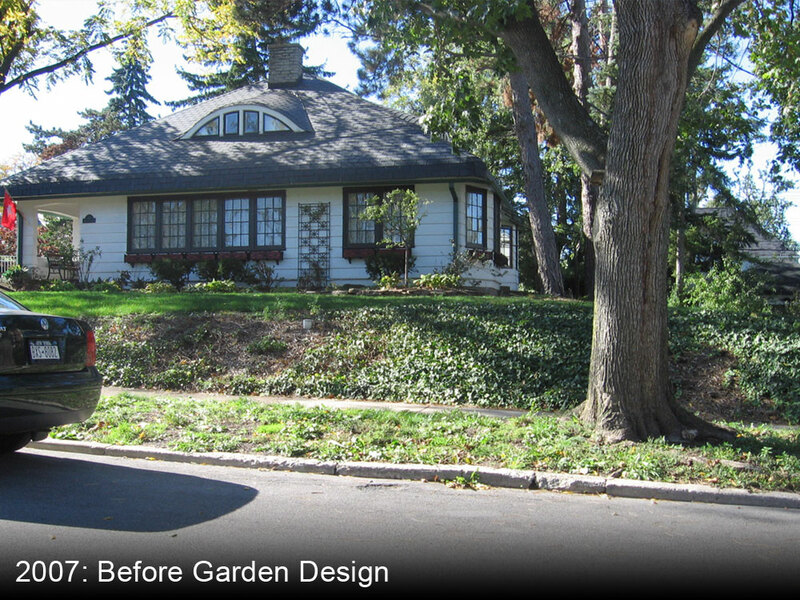 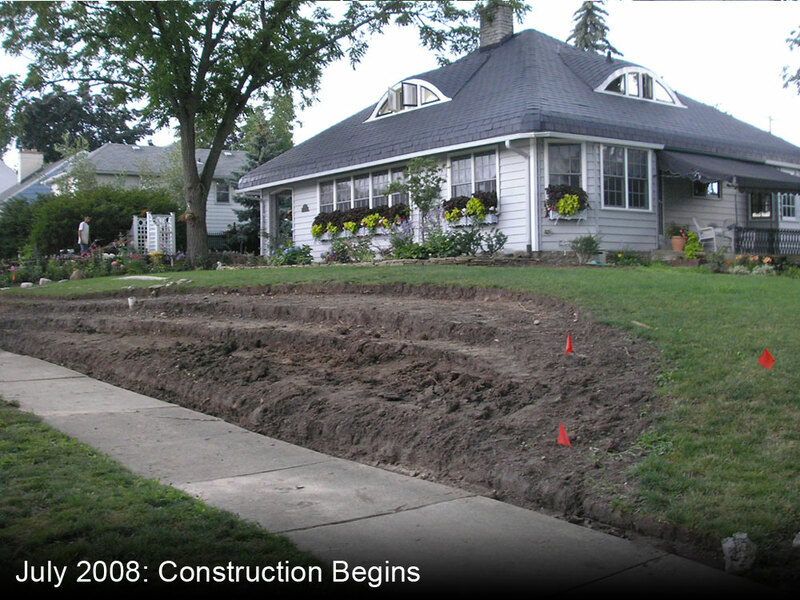 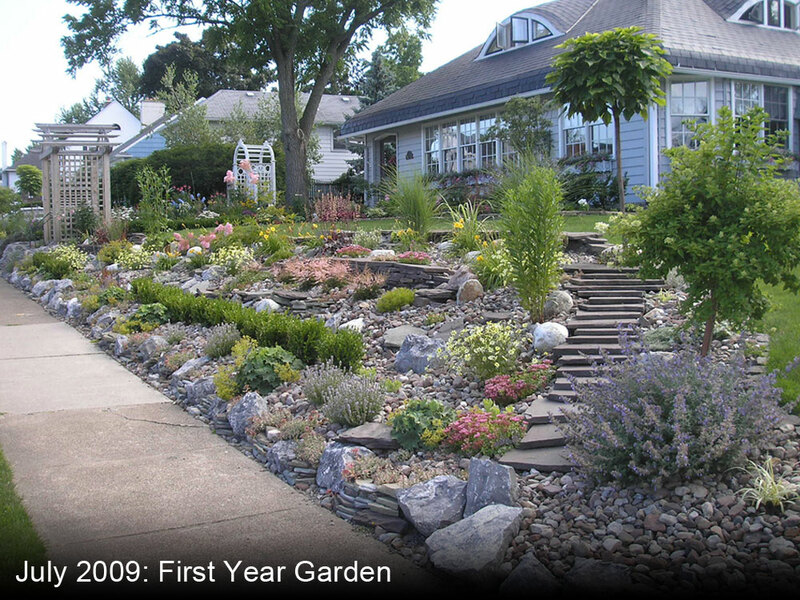 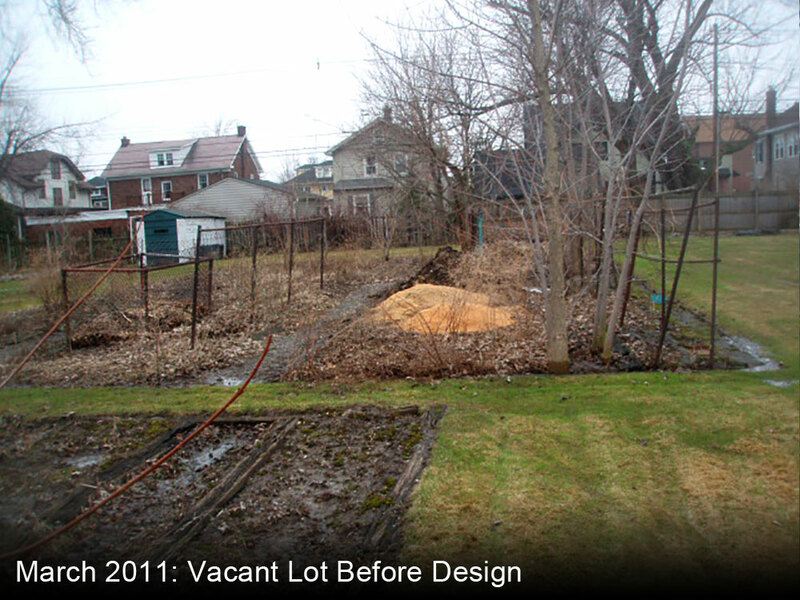 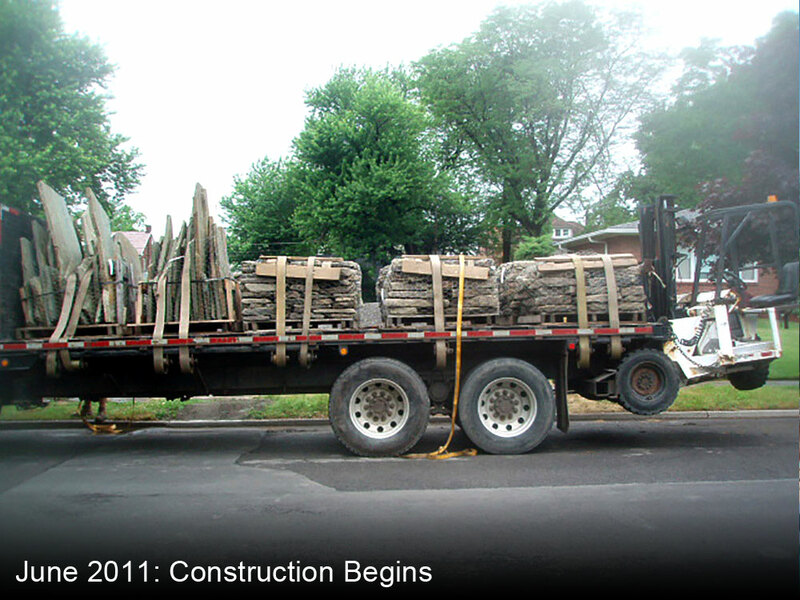 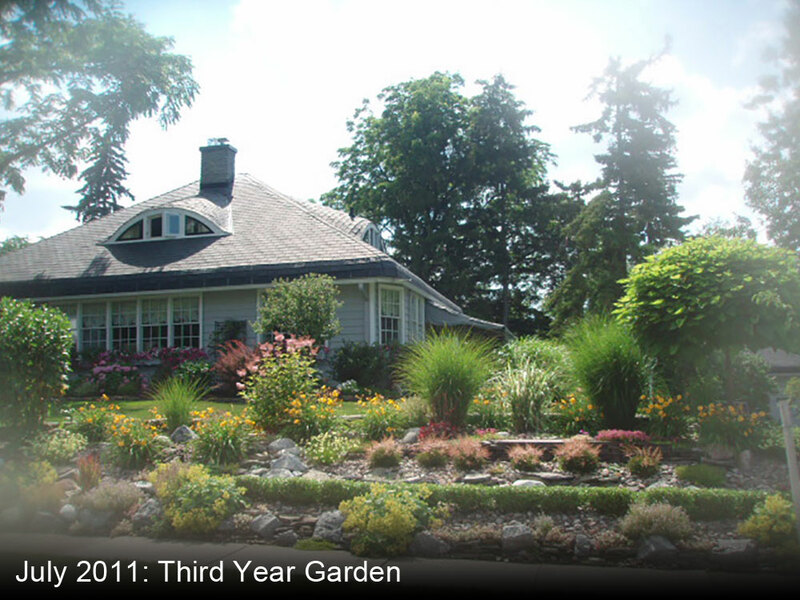 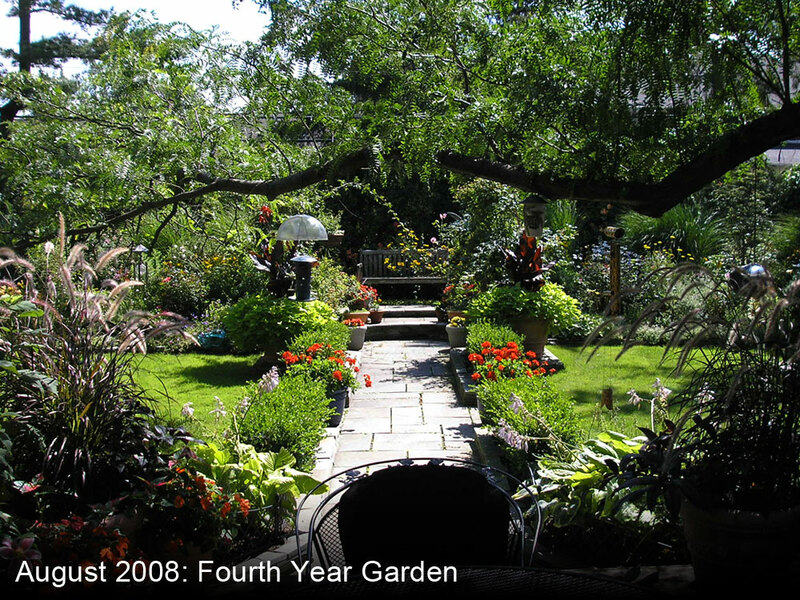 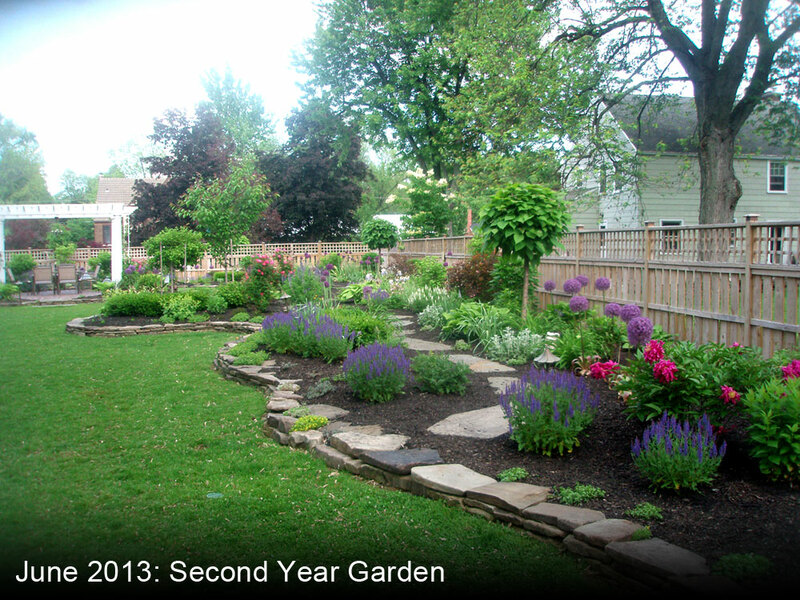 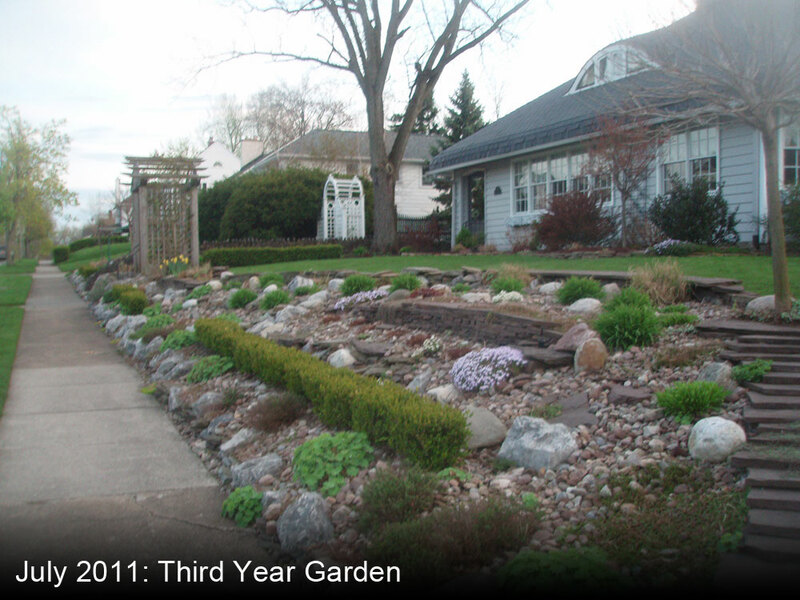 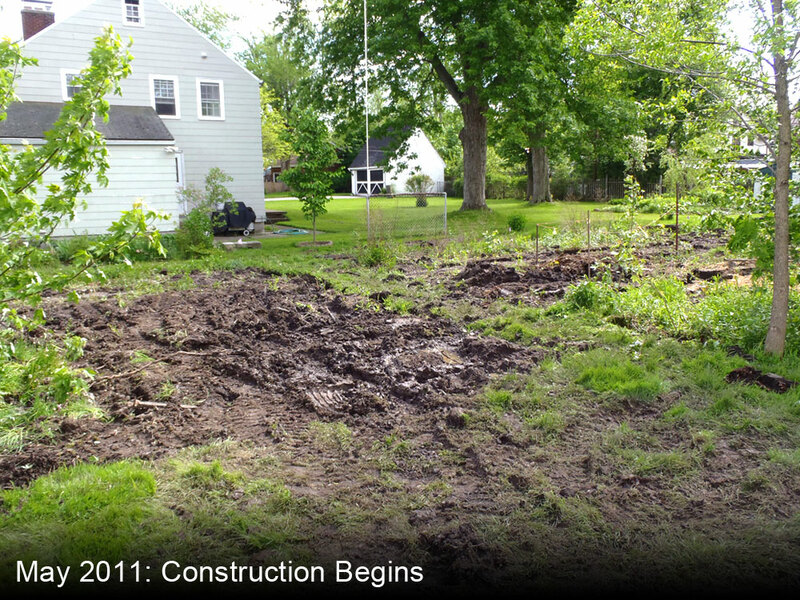 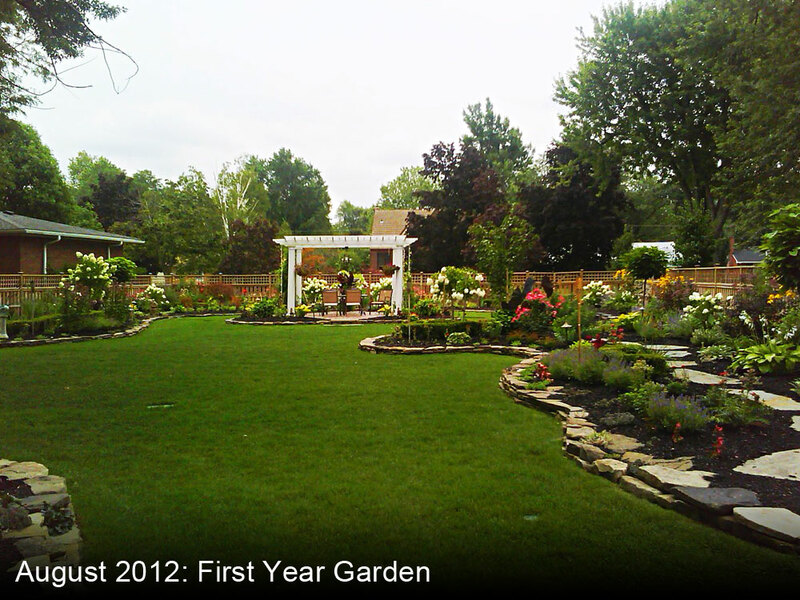 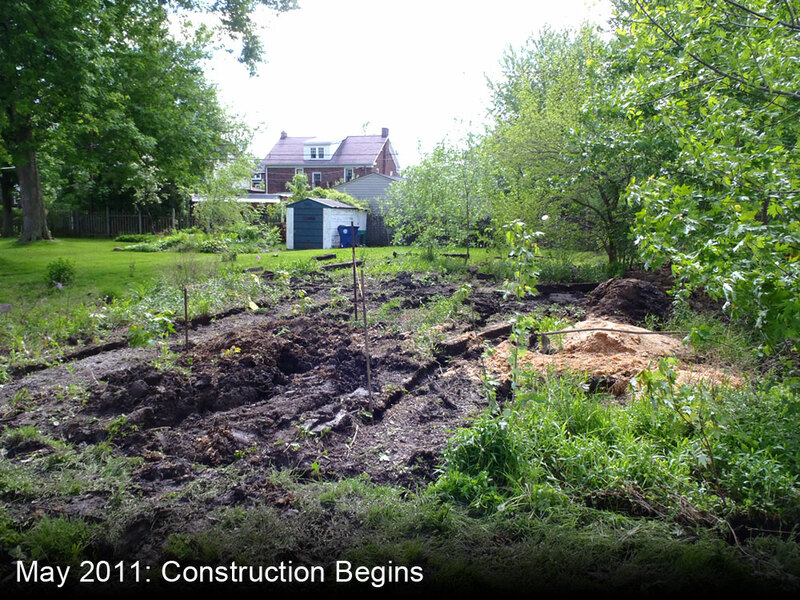 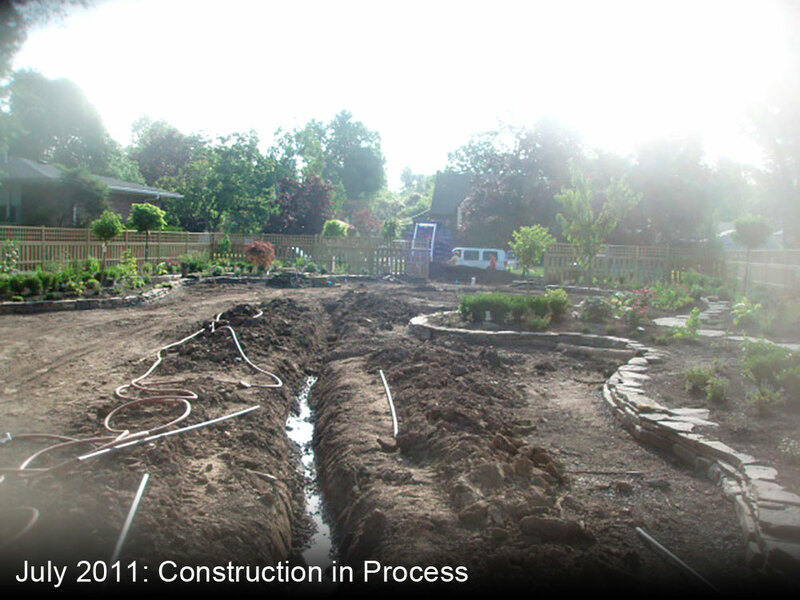 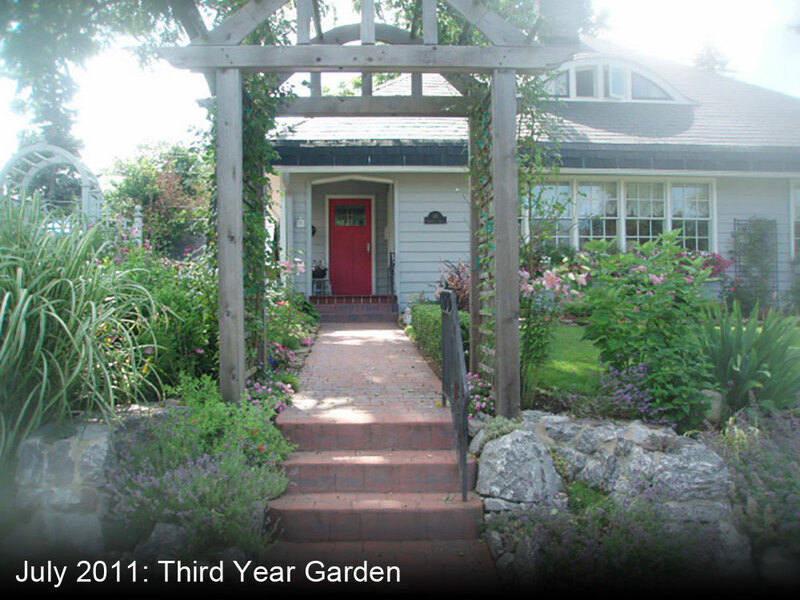 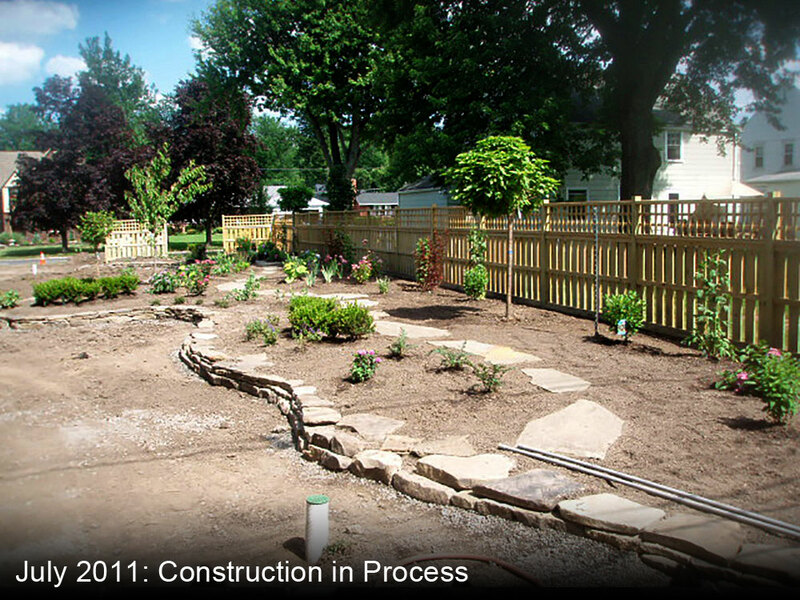 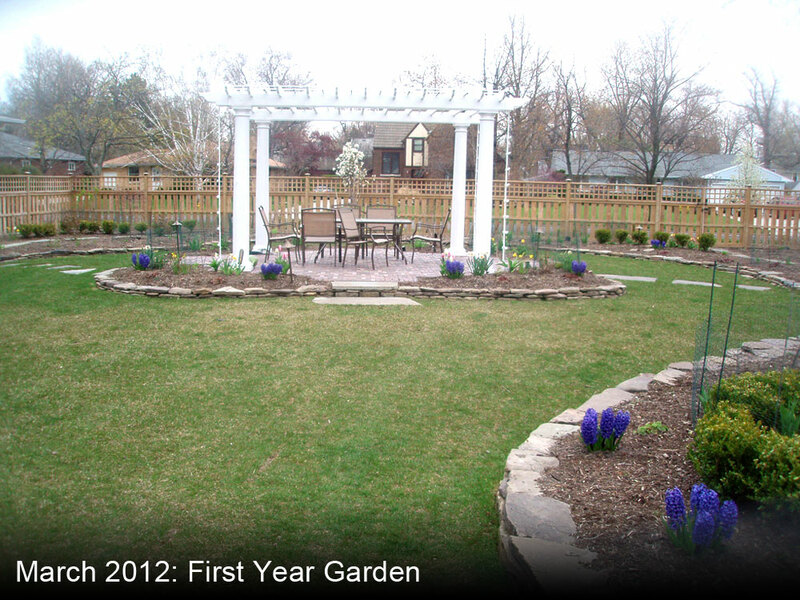 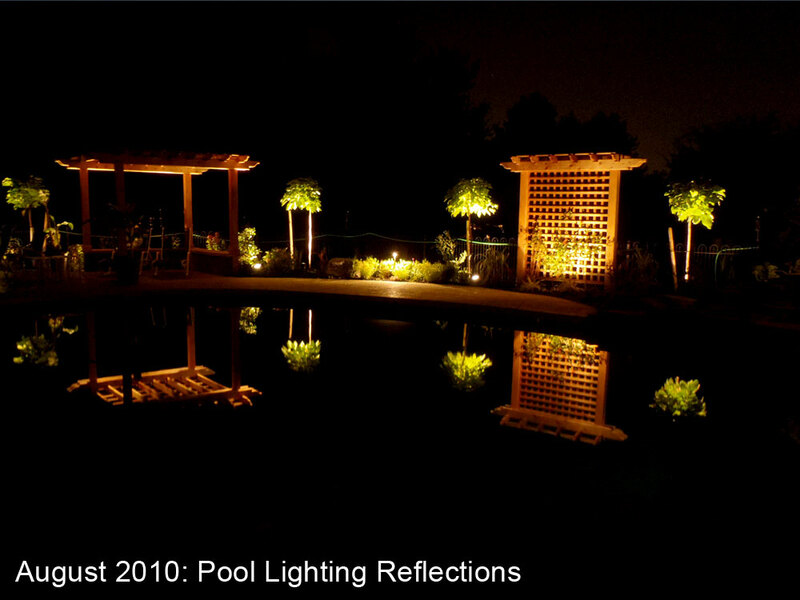 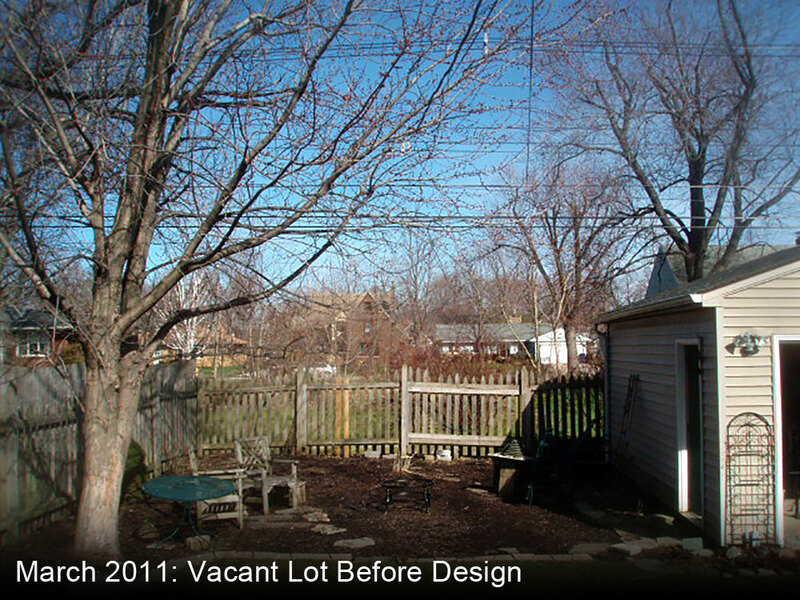 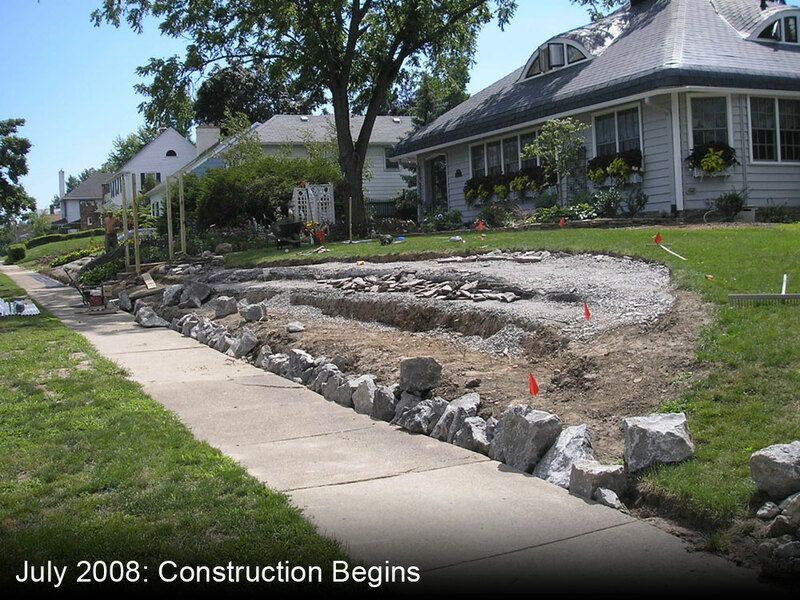 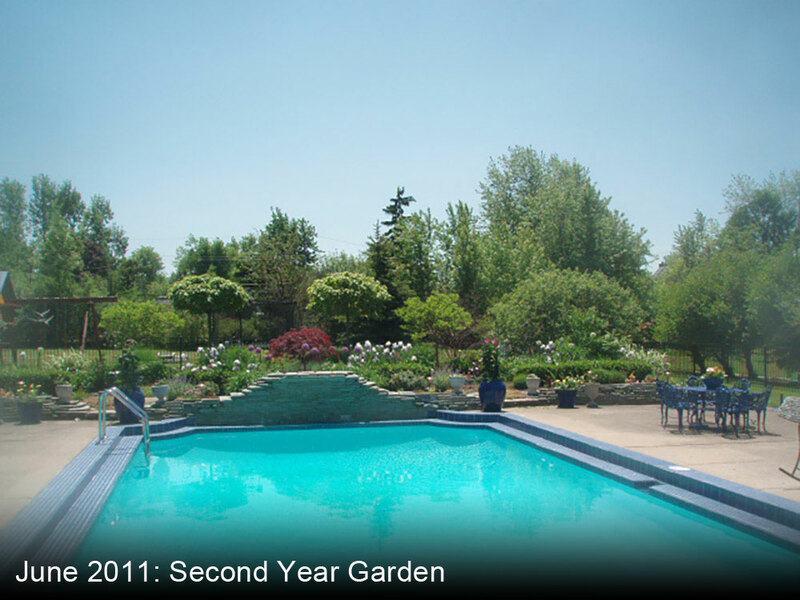 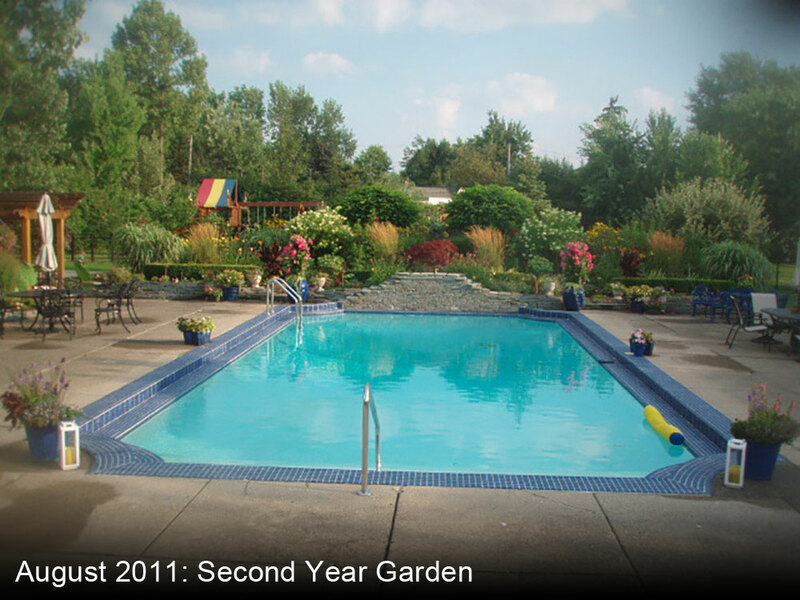 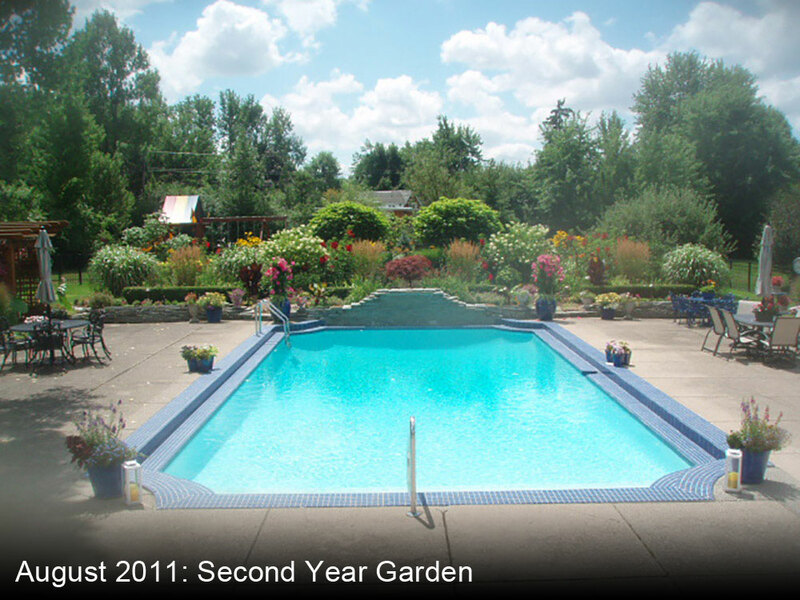 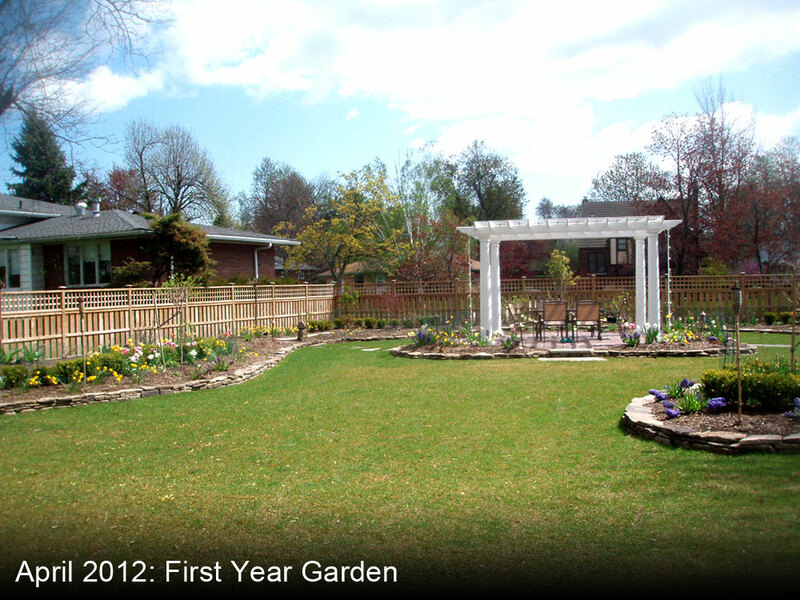 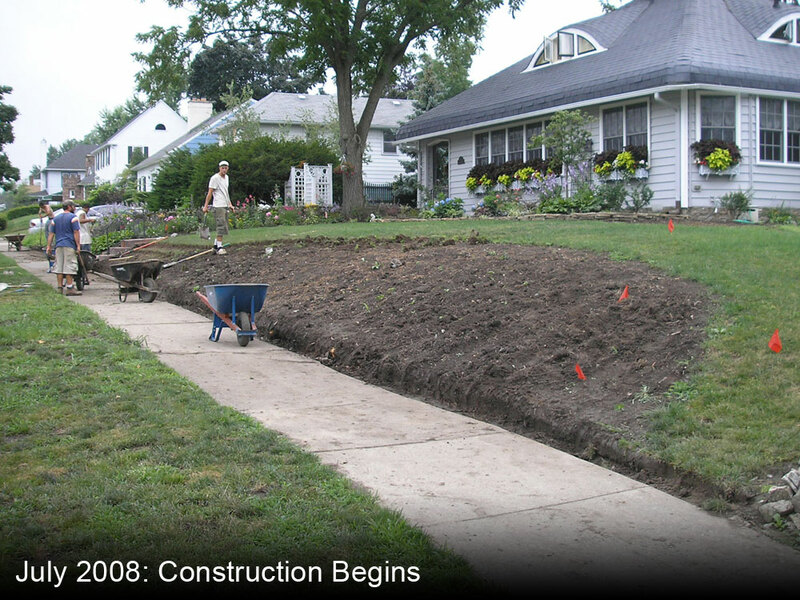 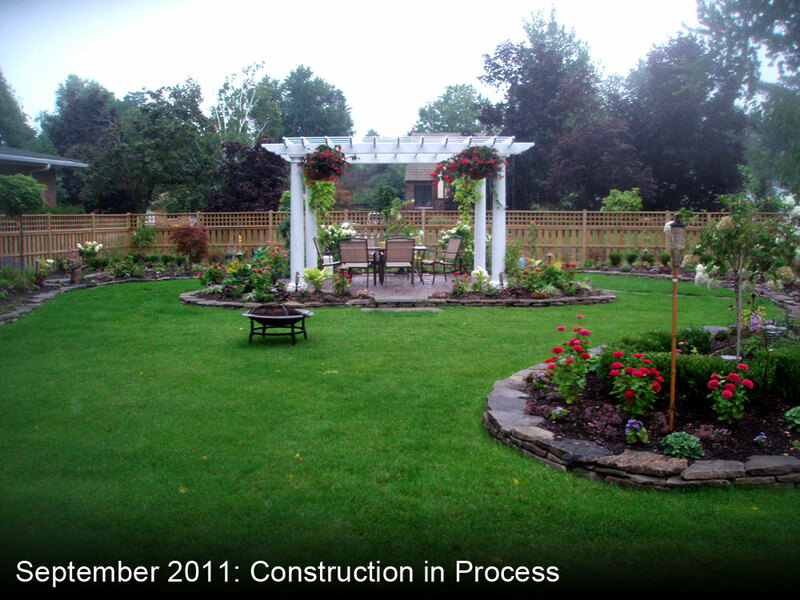 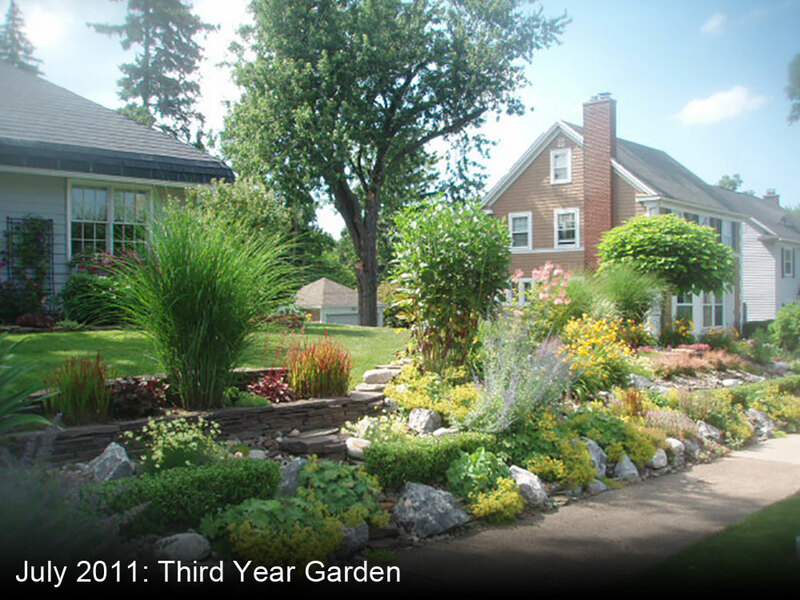 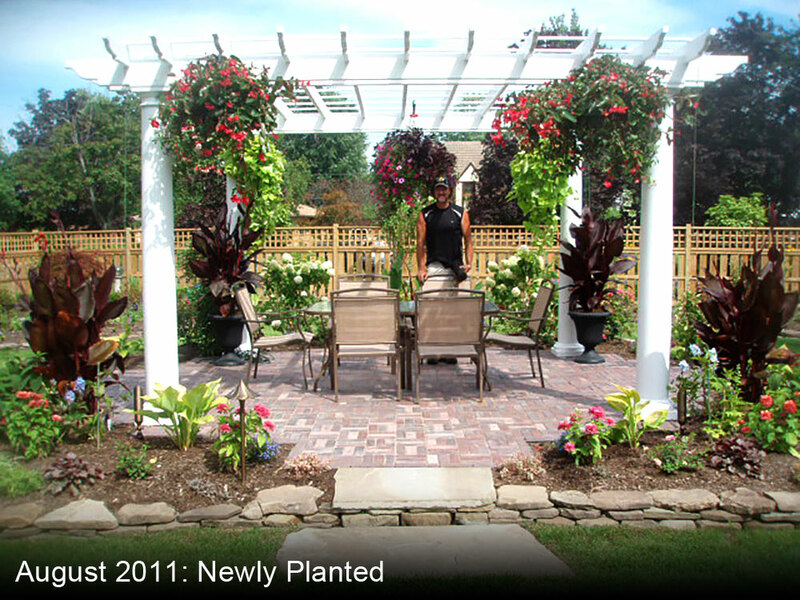 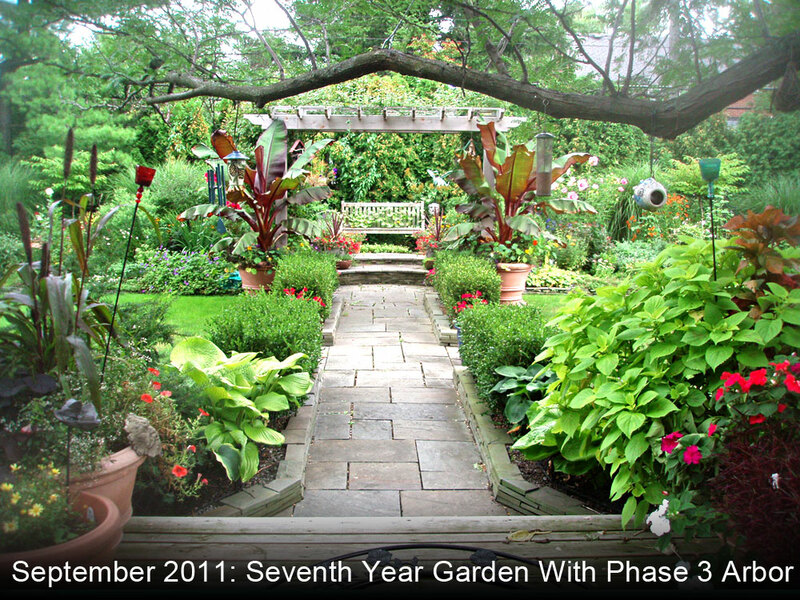 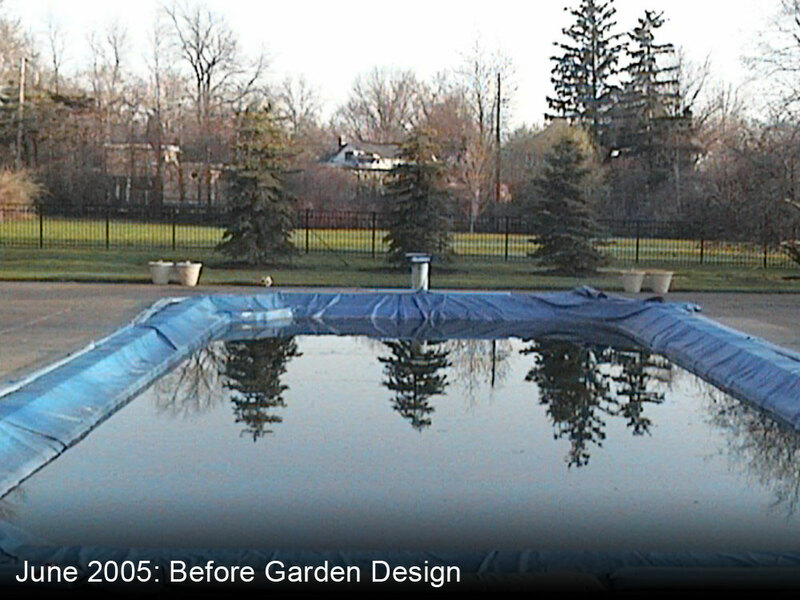 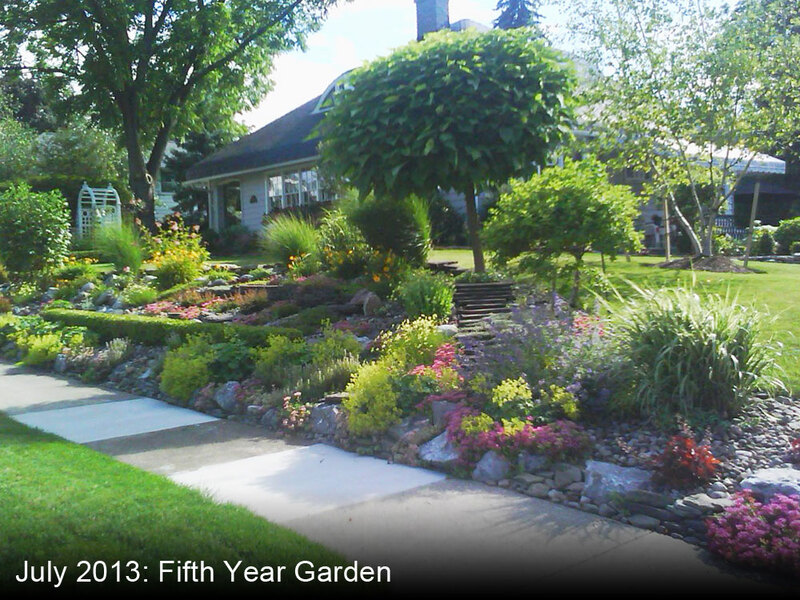 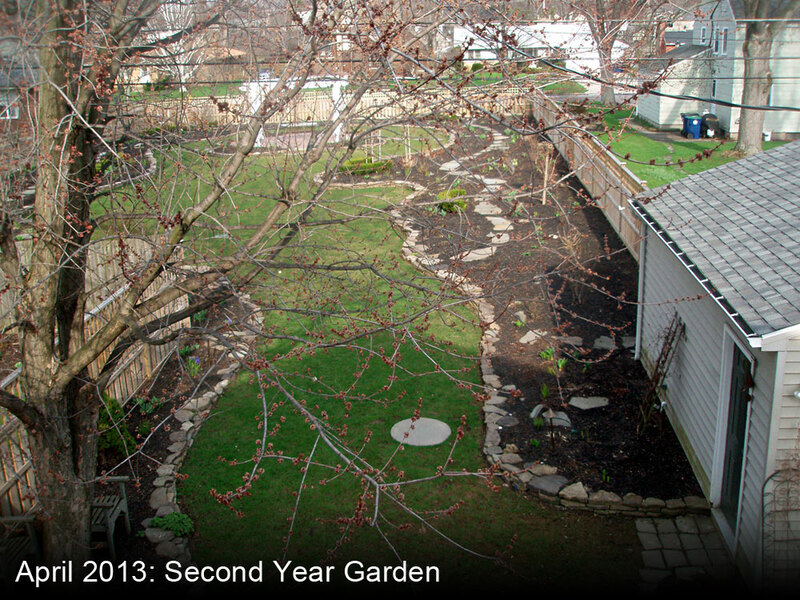 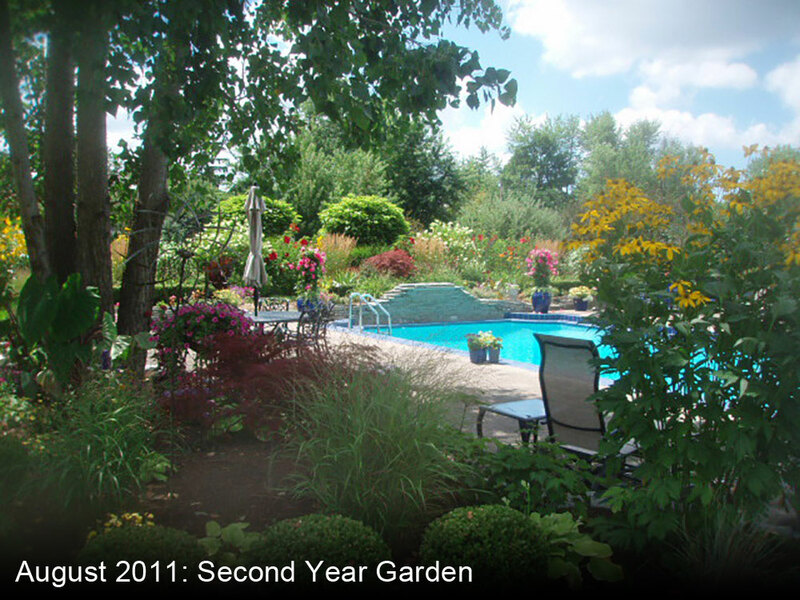 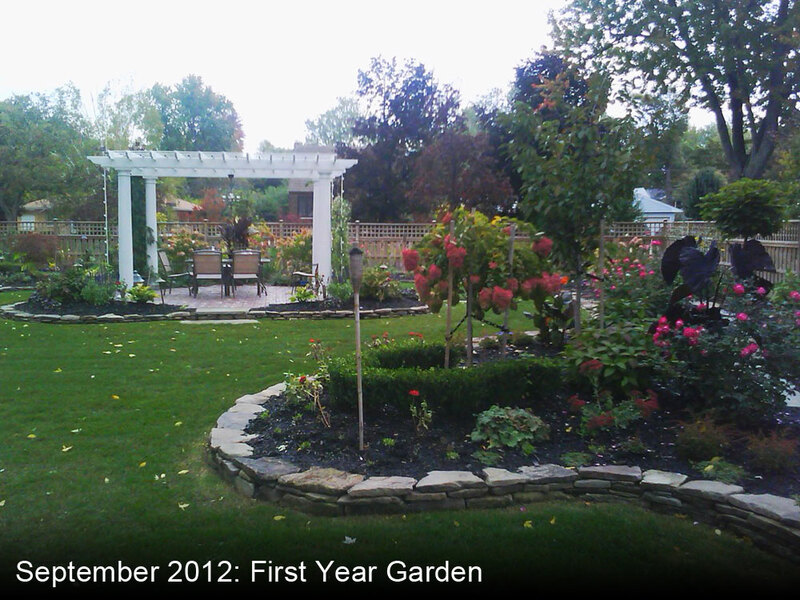 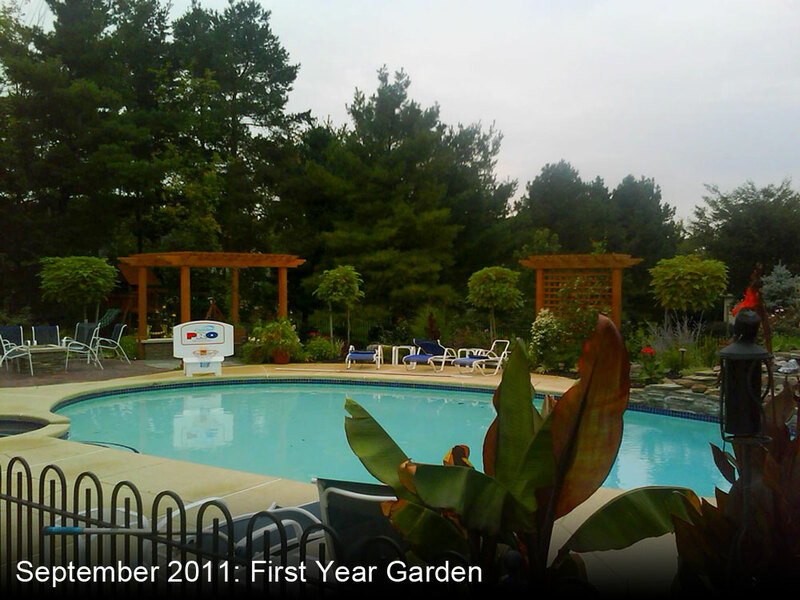 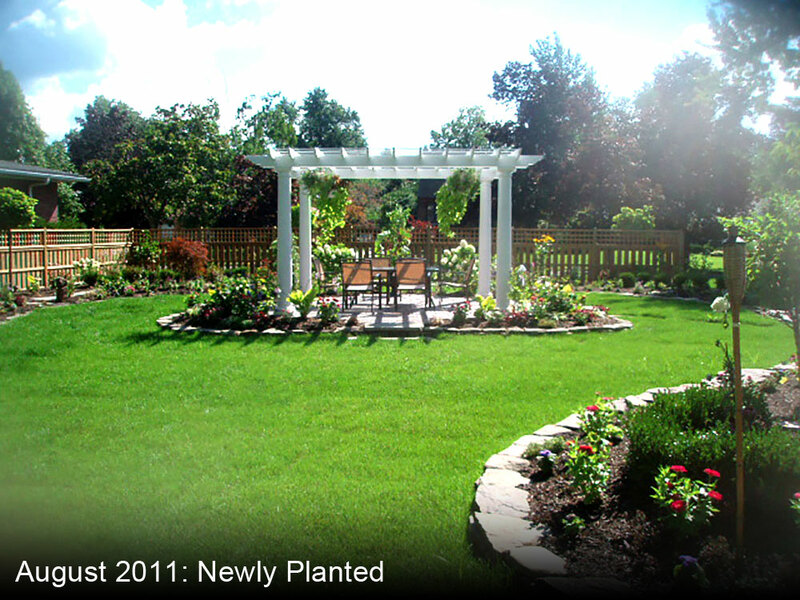 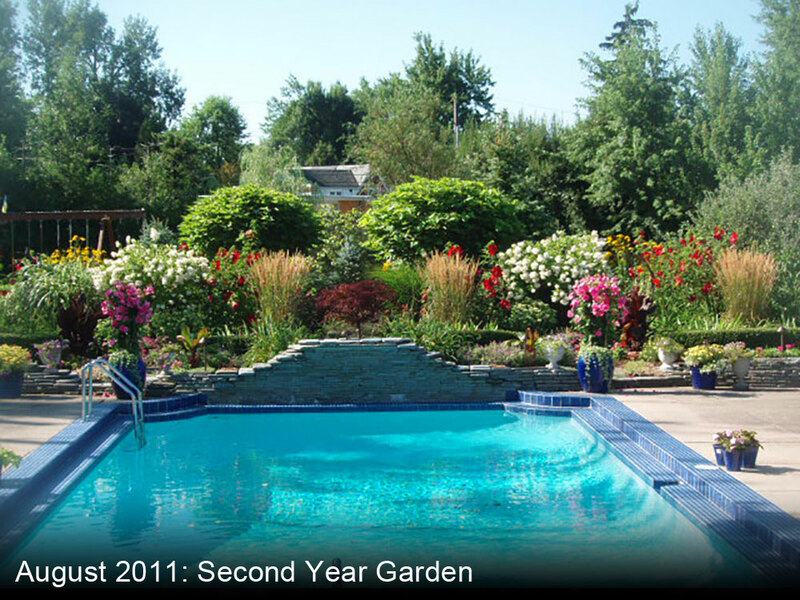 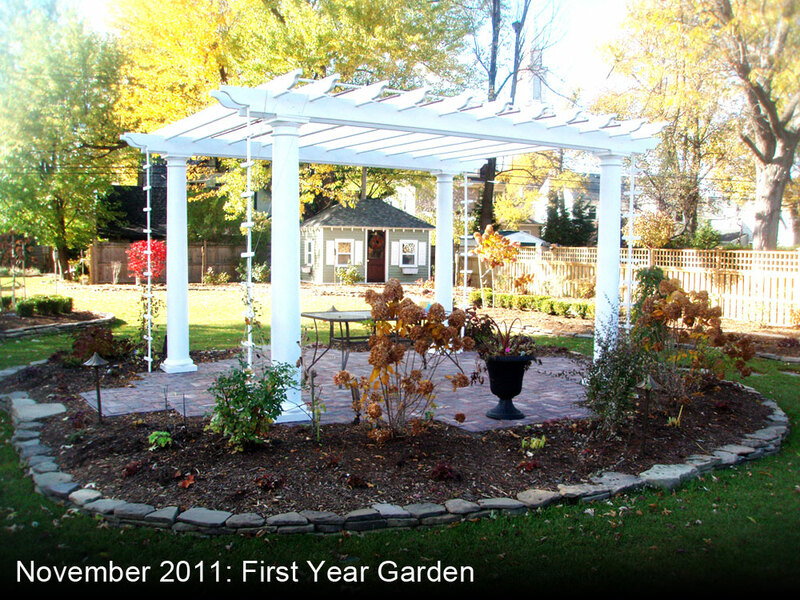 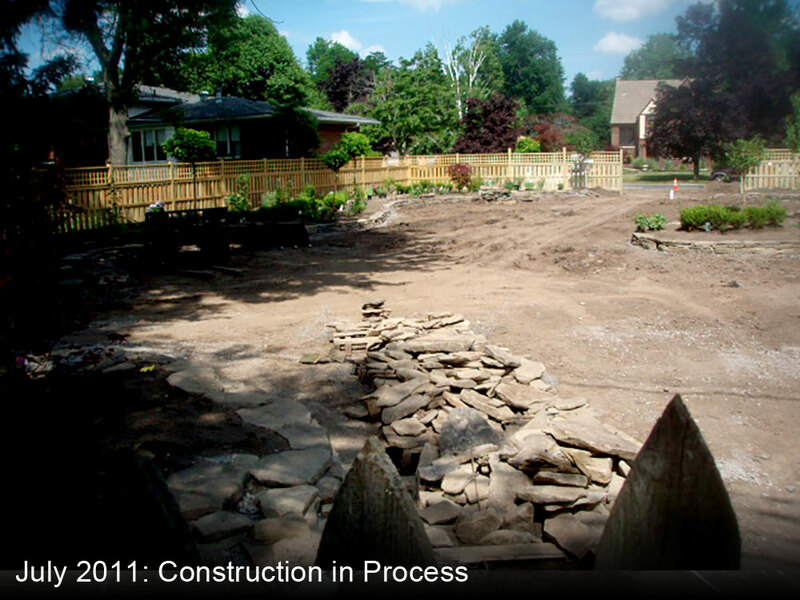 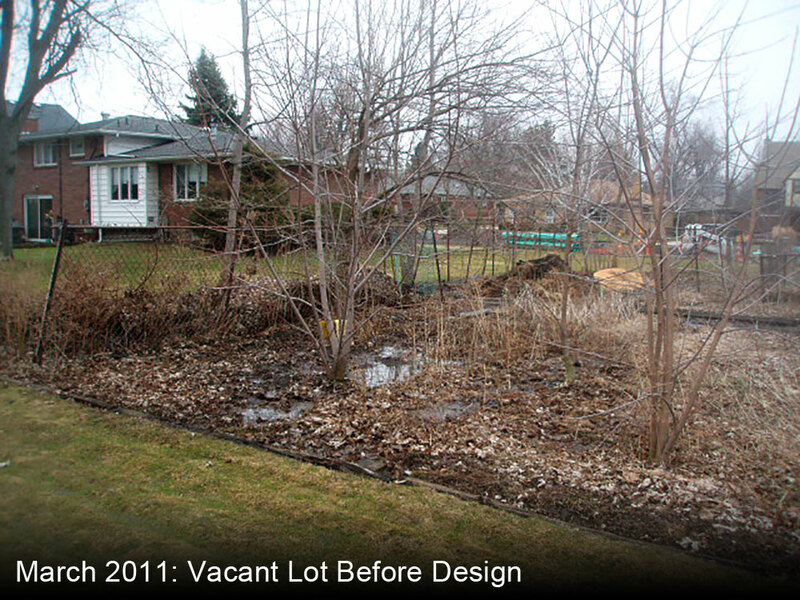 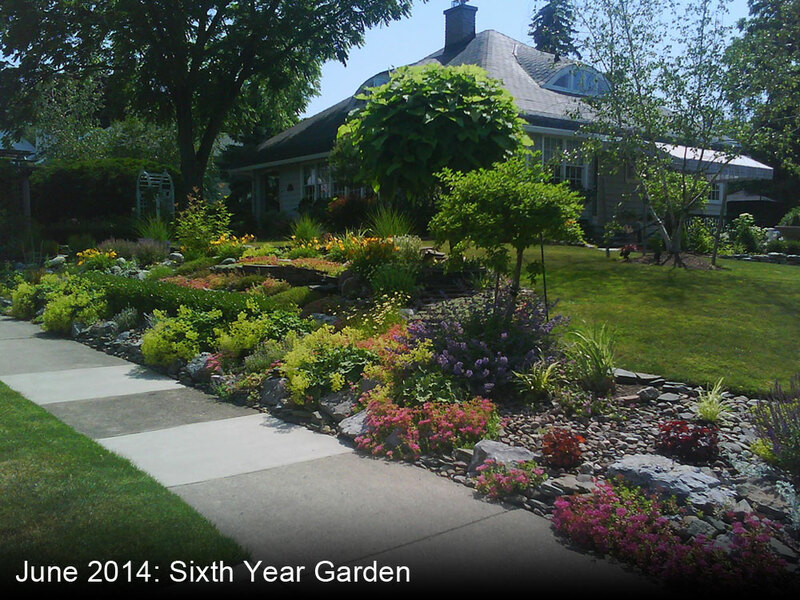 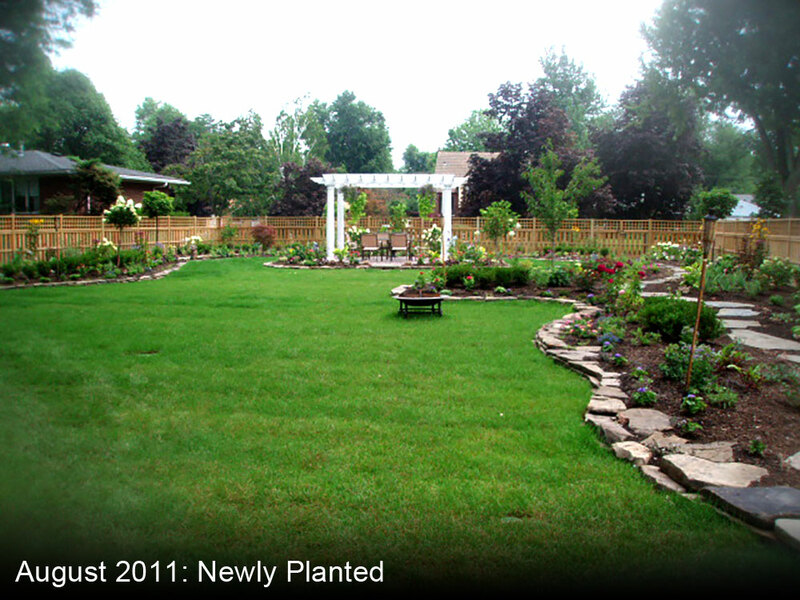 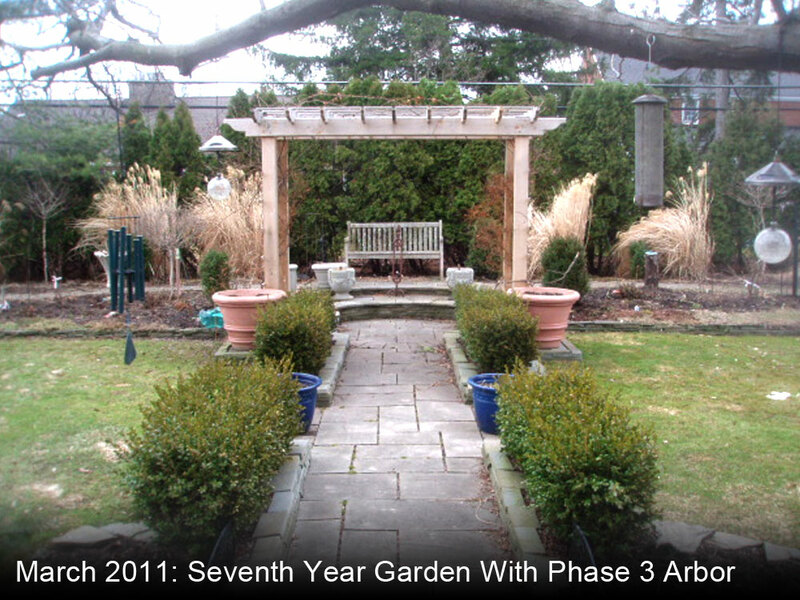 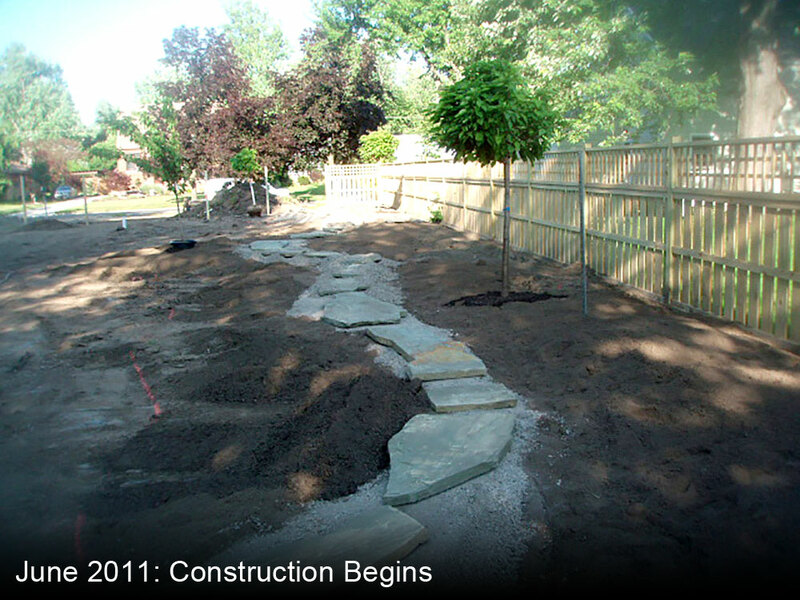 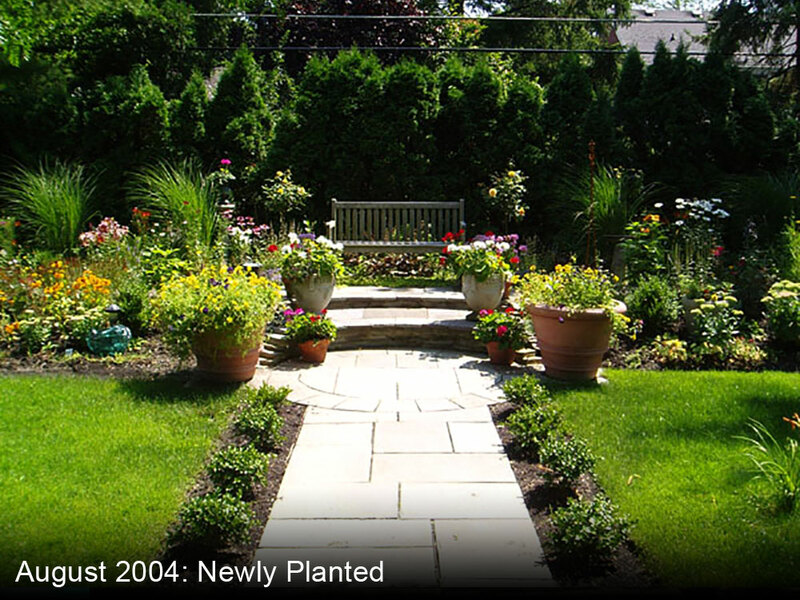 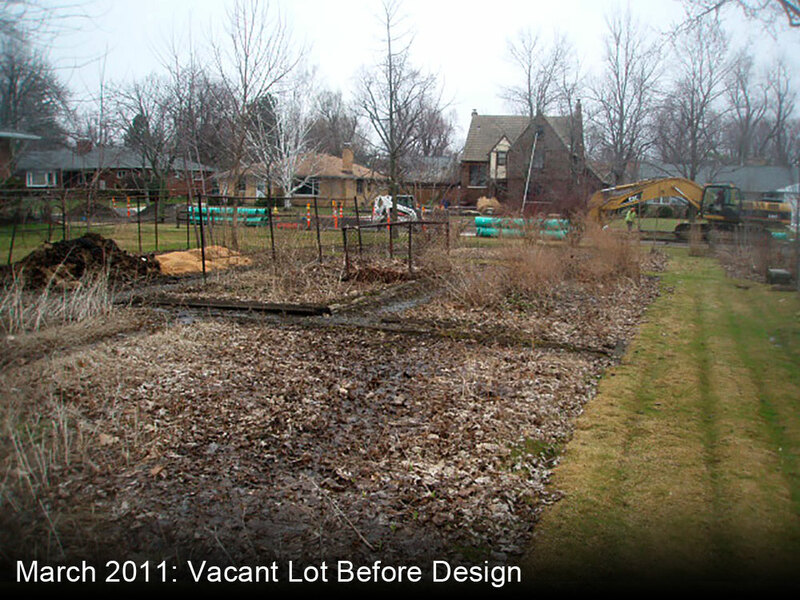 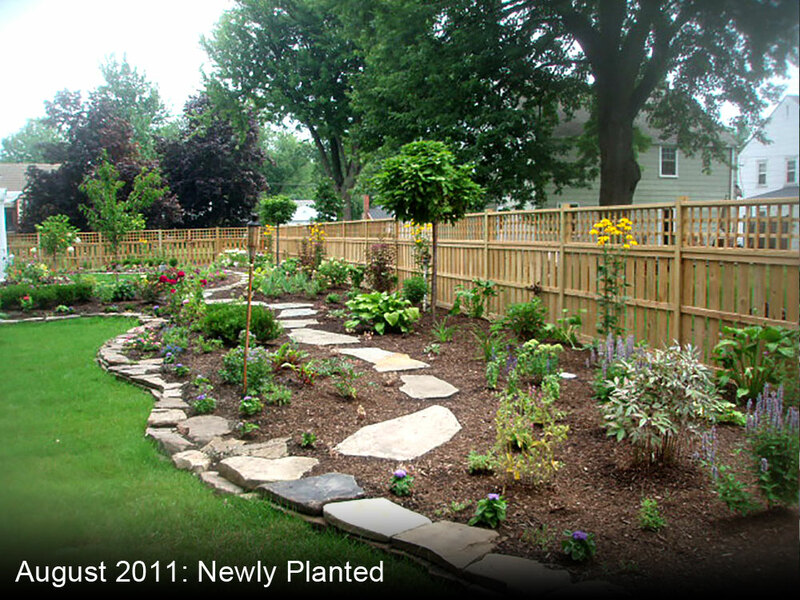 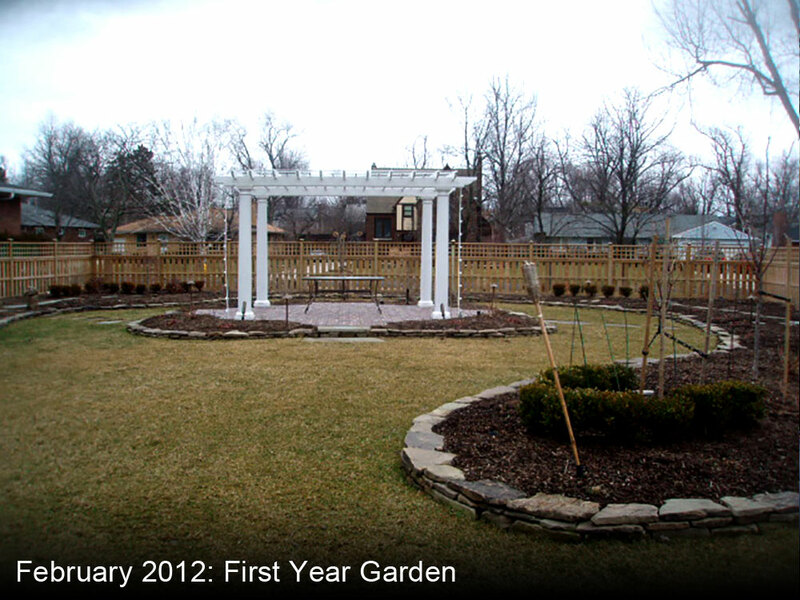 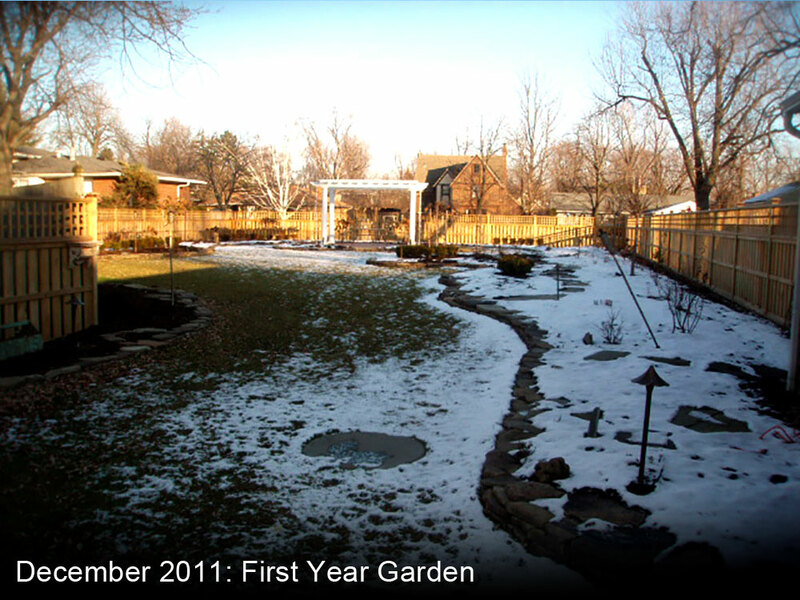 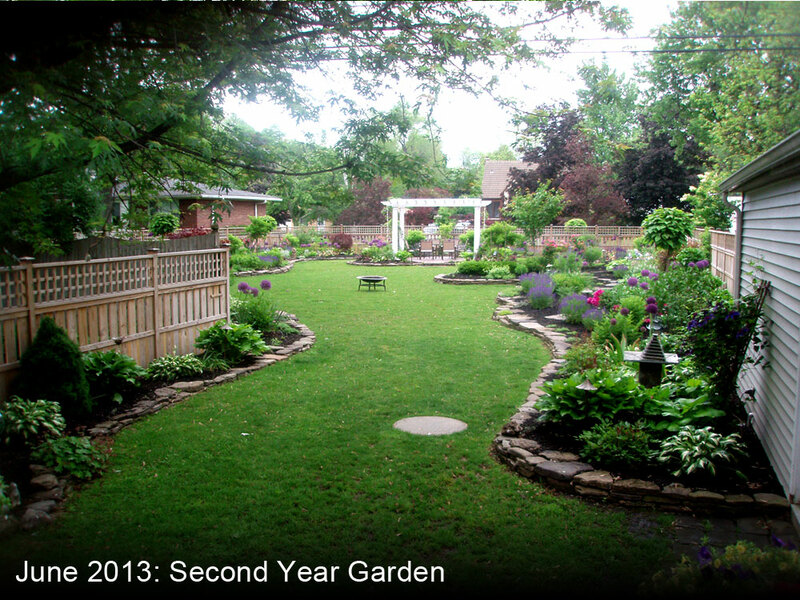 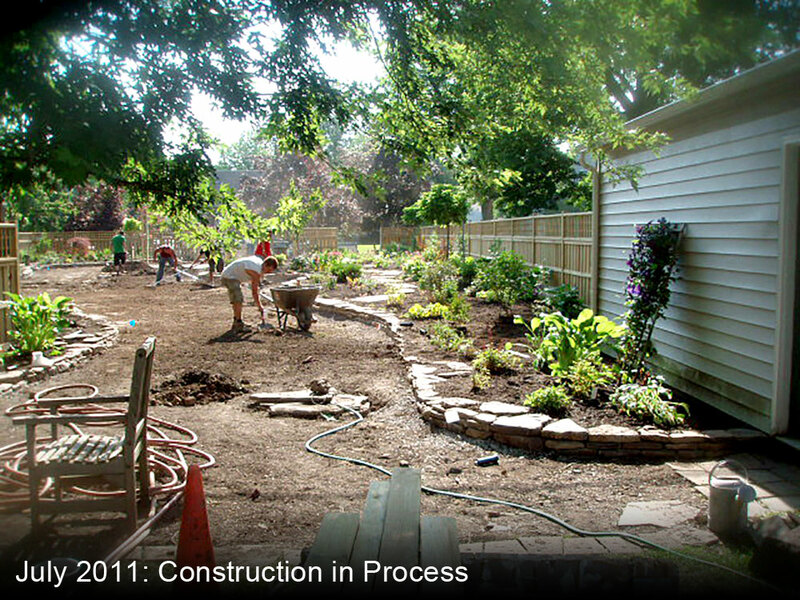 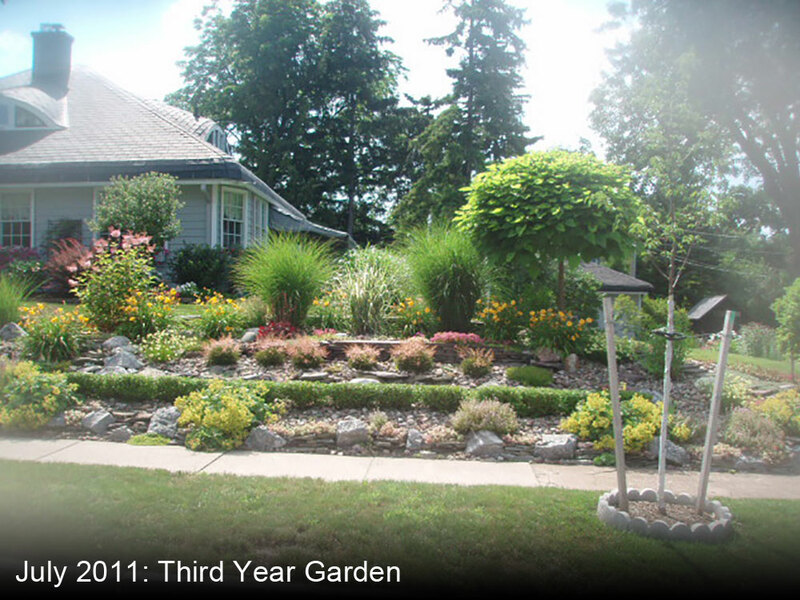 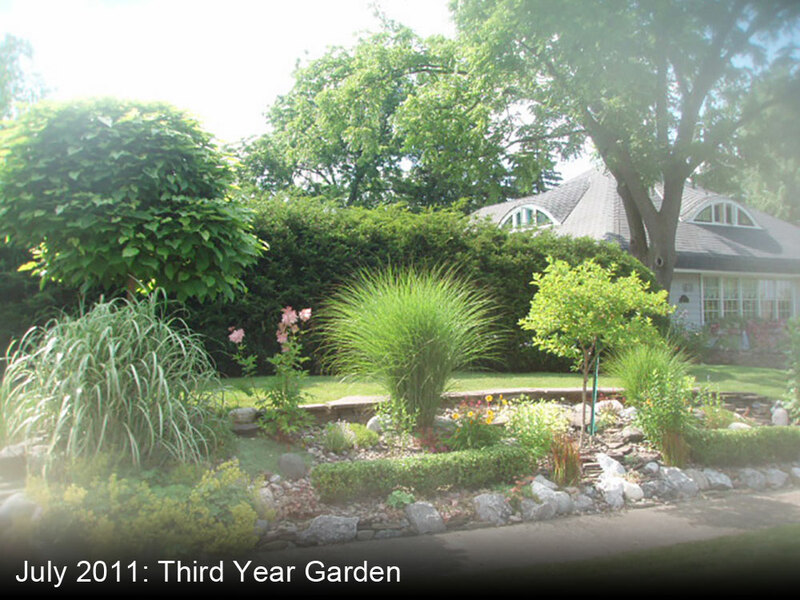 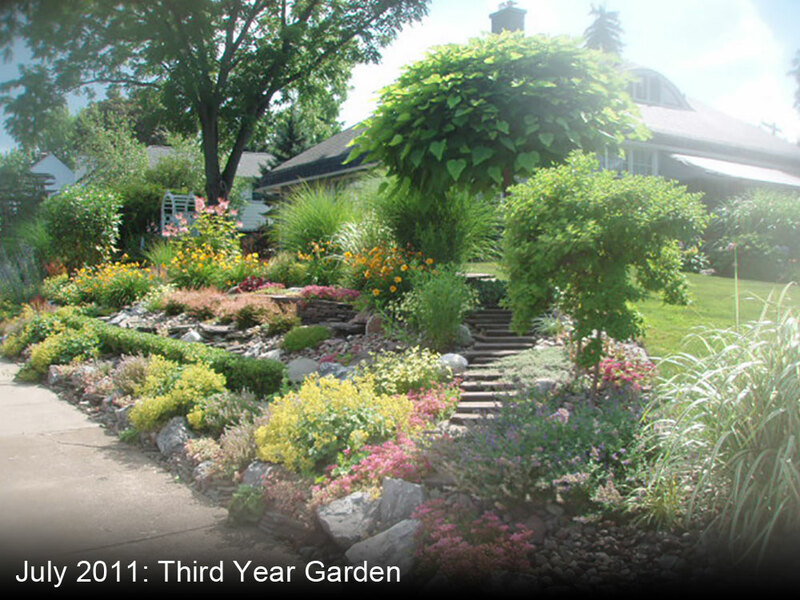 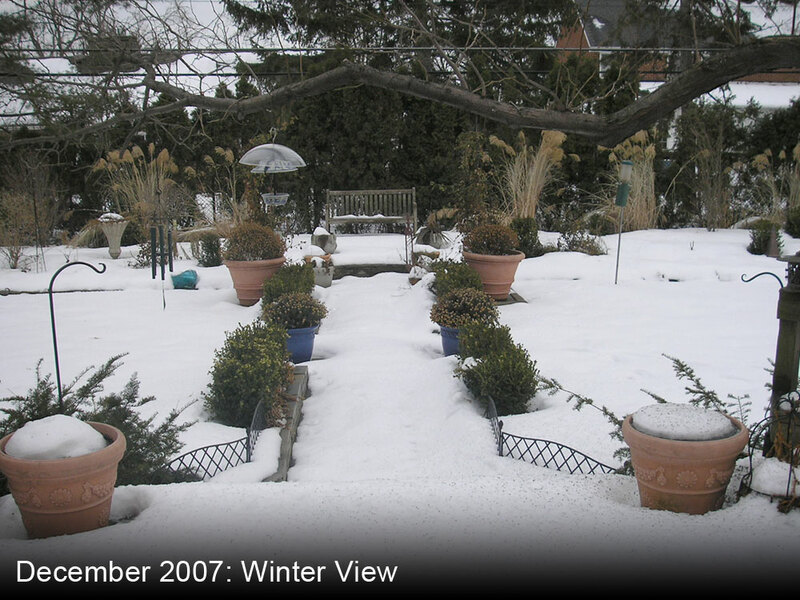 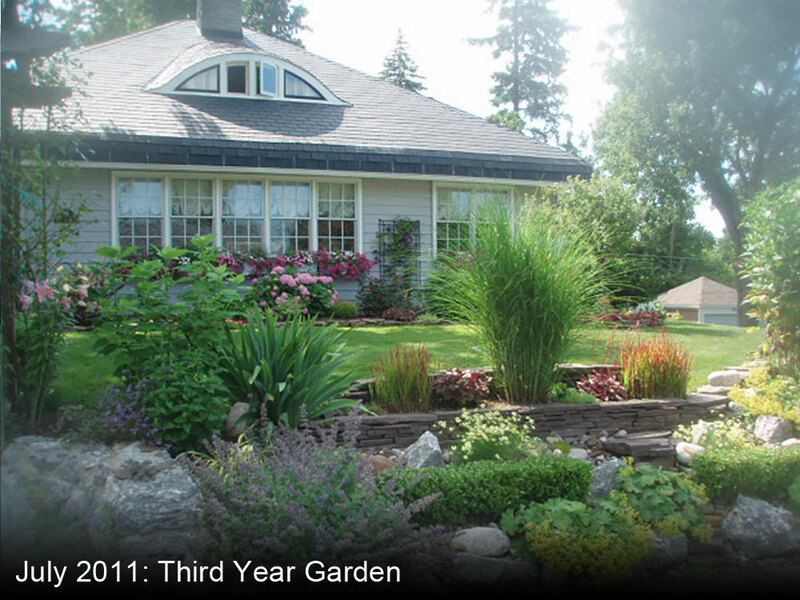 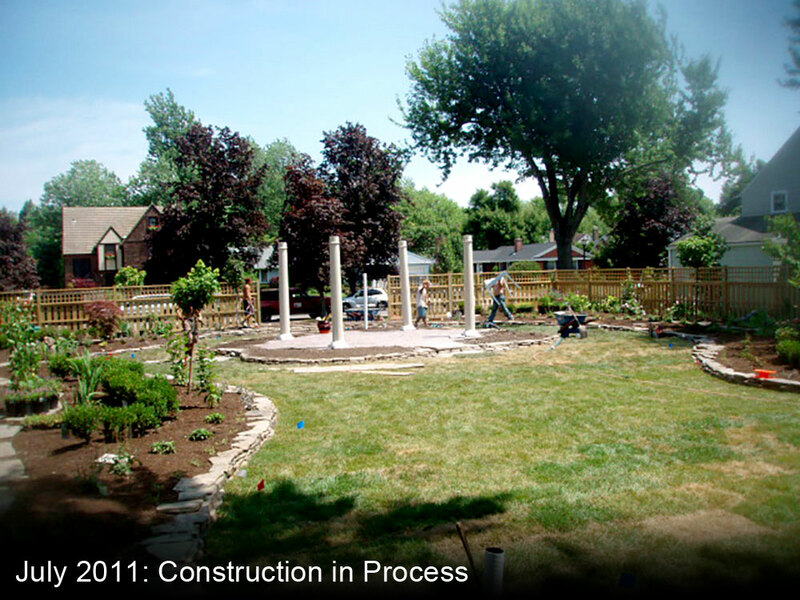 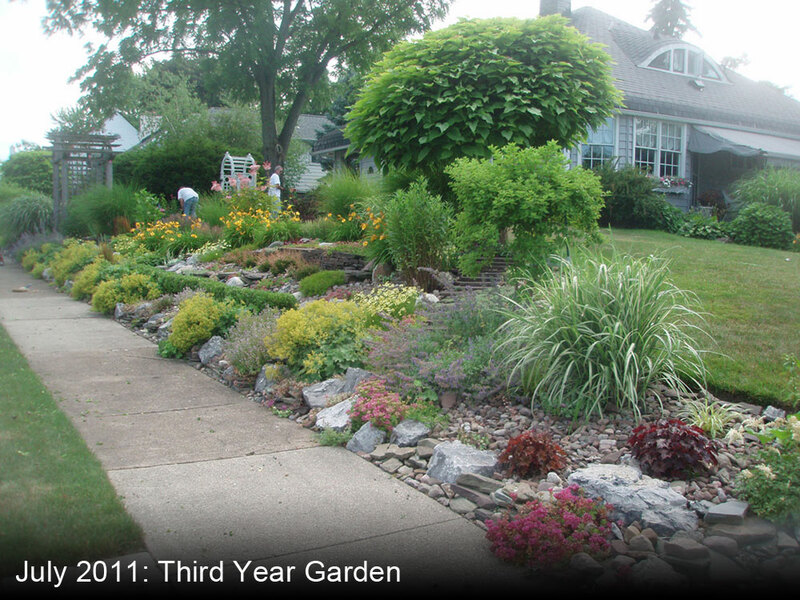 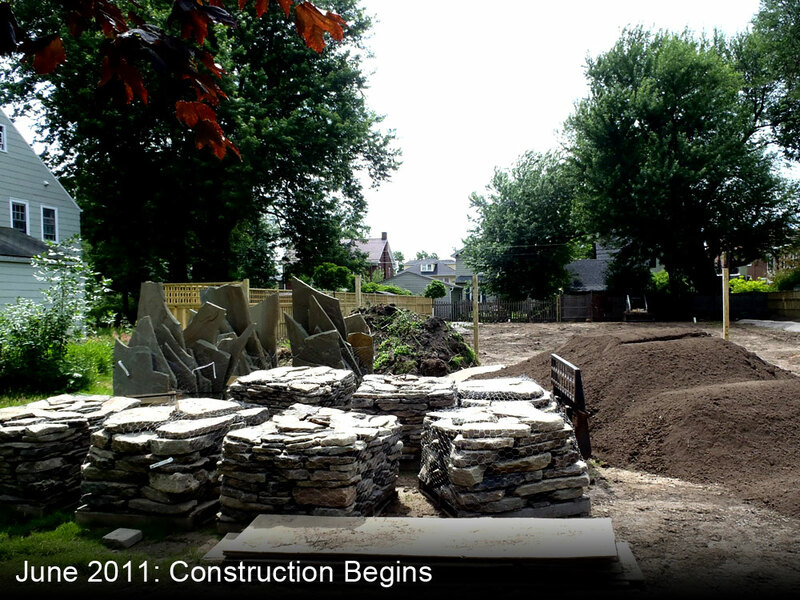 Beginning in 2007, a design evolved, resulting in hazardous trees removed and a front garden transformation. 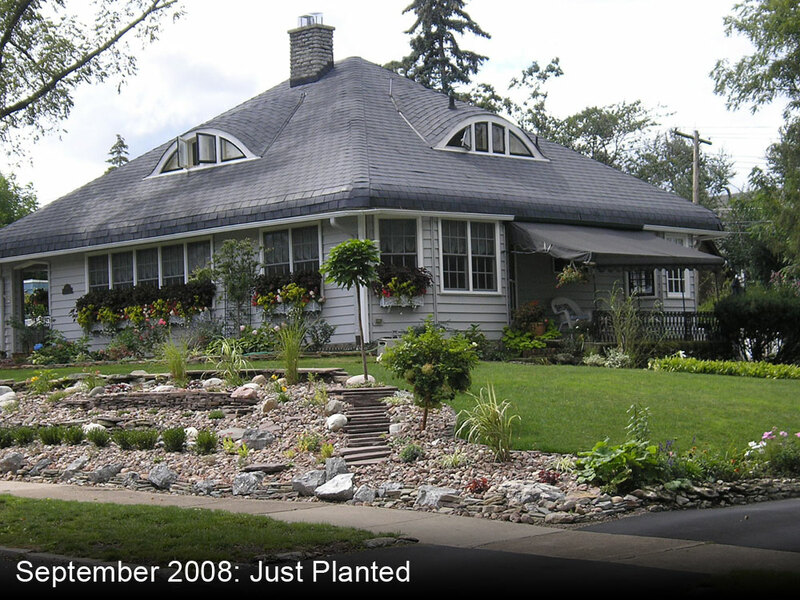 The design complemented the home’s architecture with flagstone echoing the unusual roof style, and an arbor that mimics the eyebrow windows. 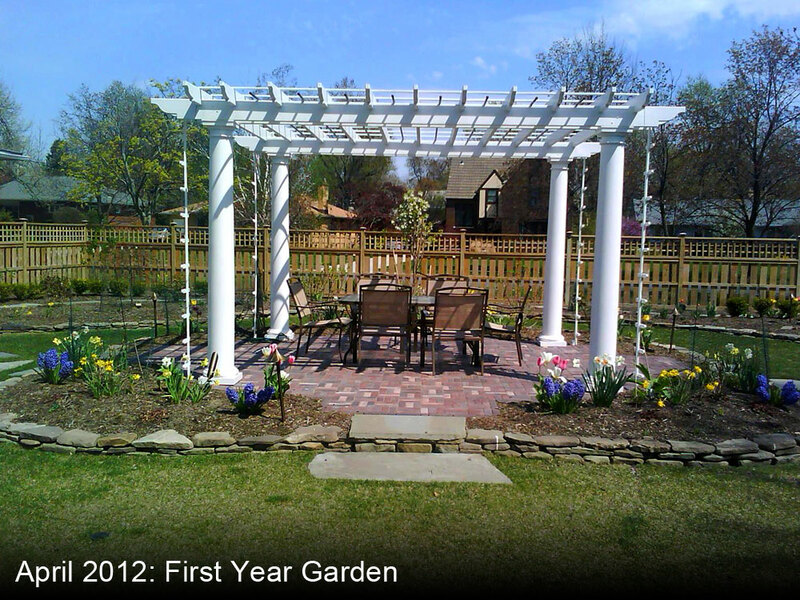 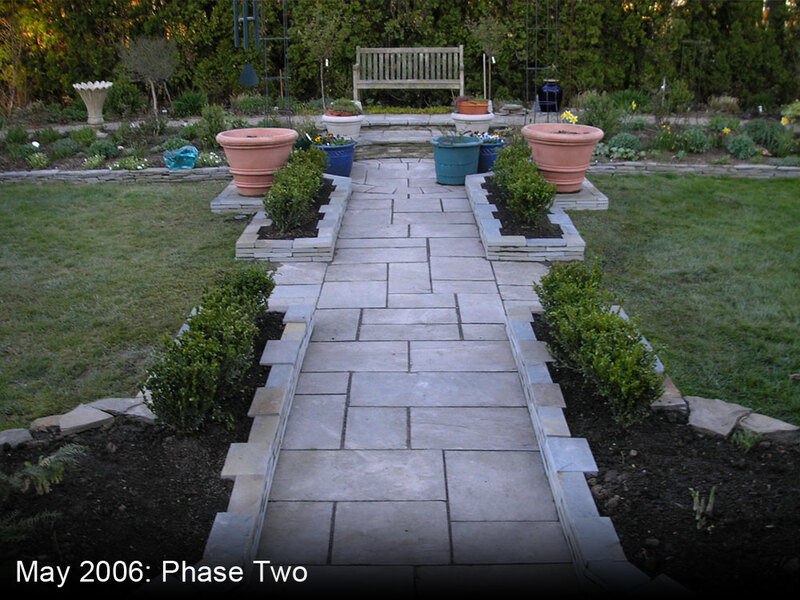 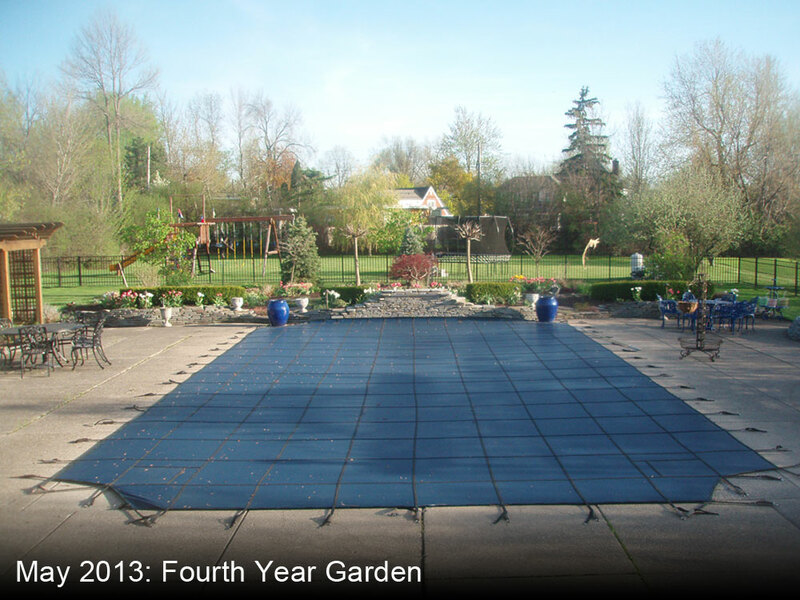 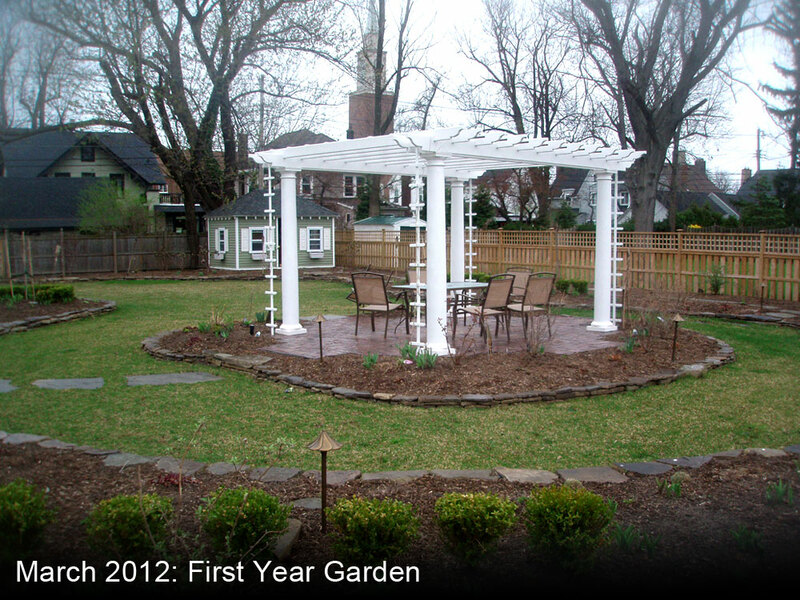 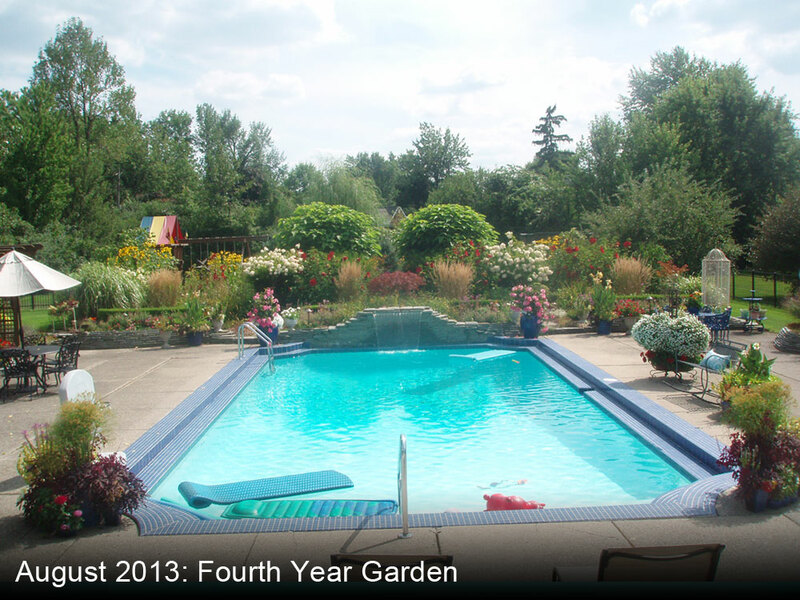 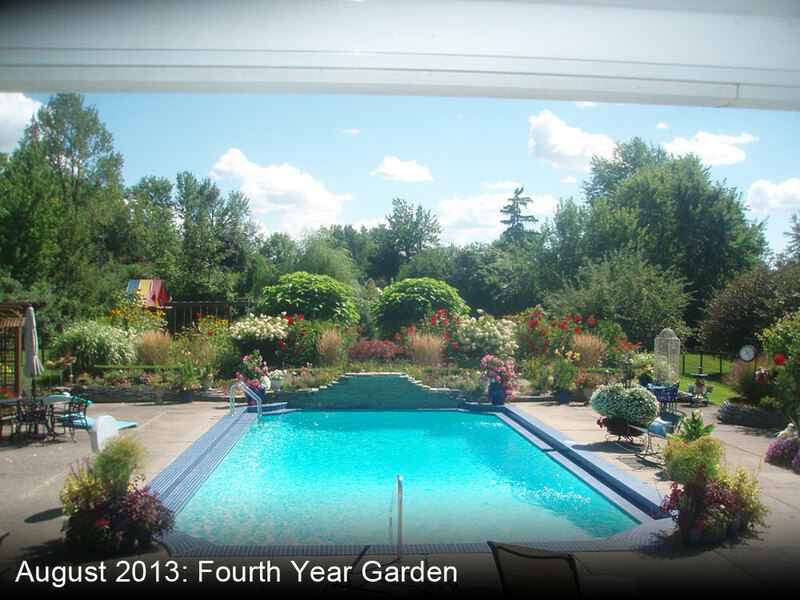 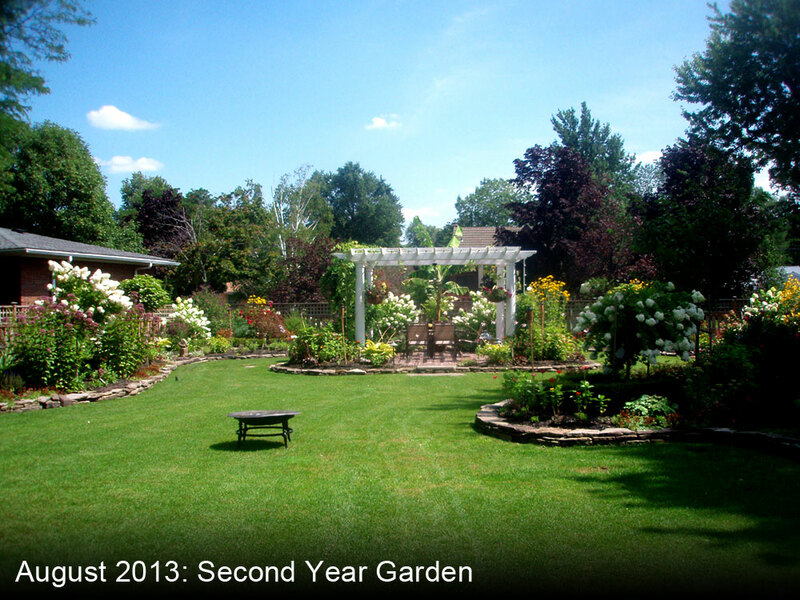 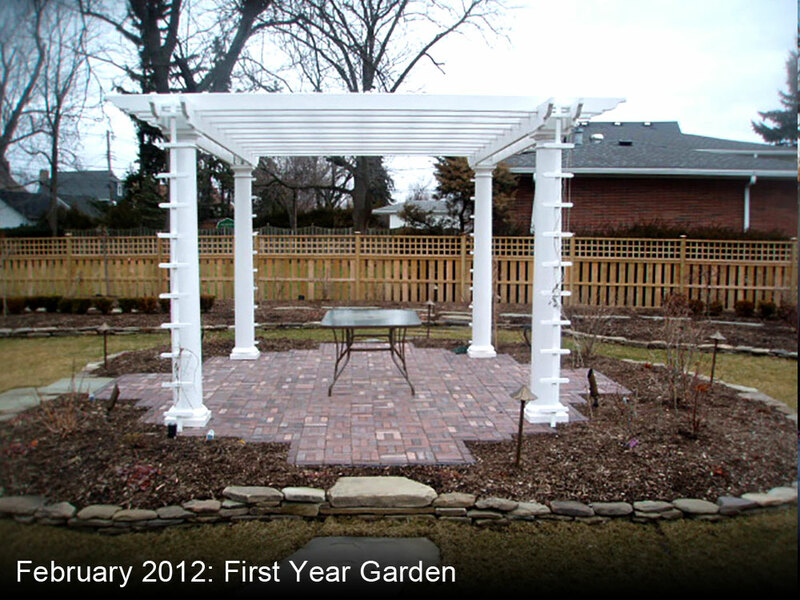 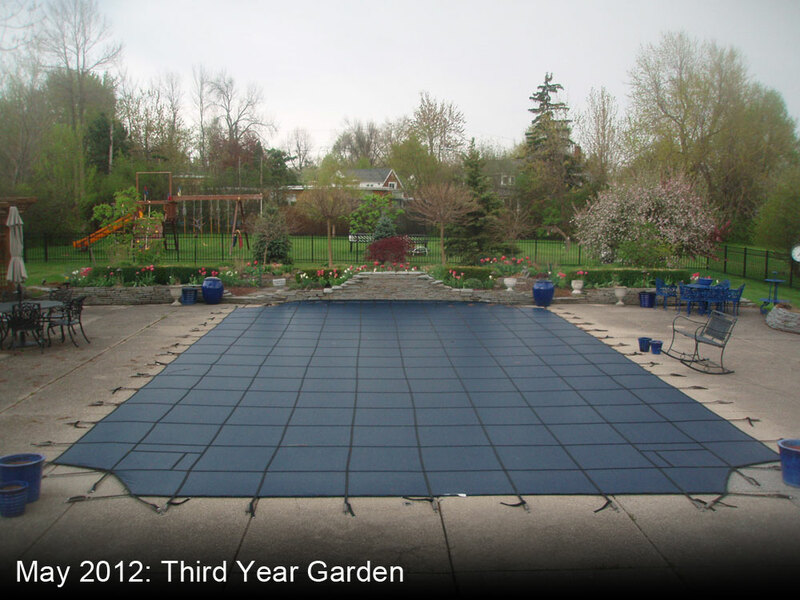 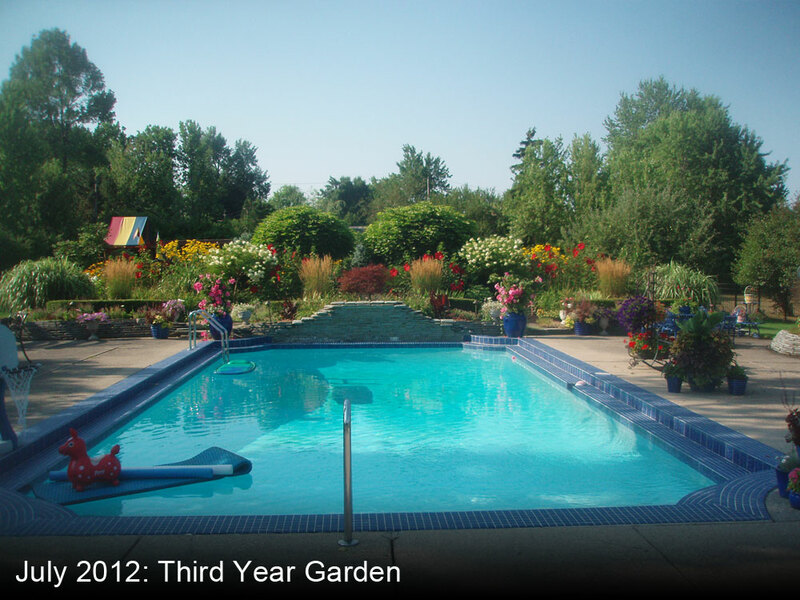 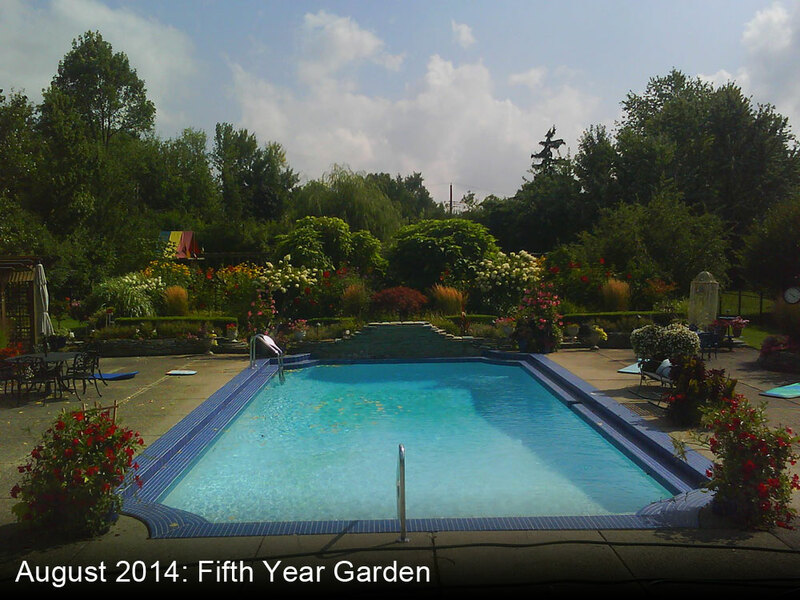 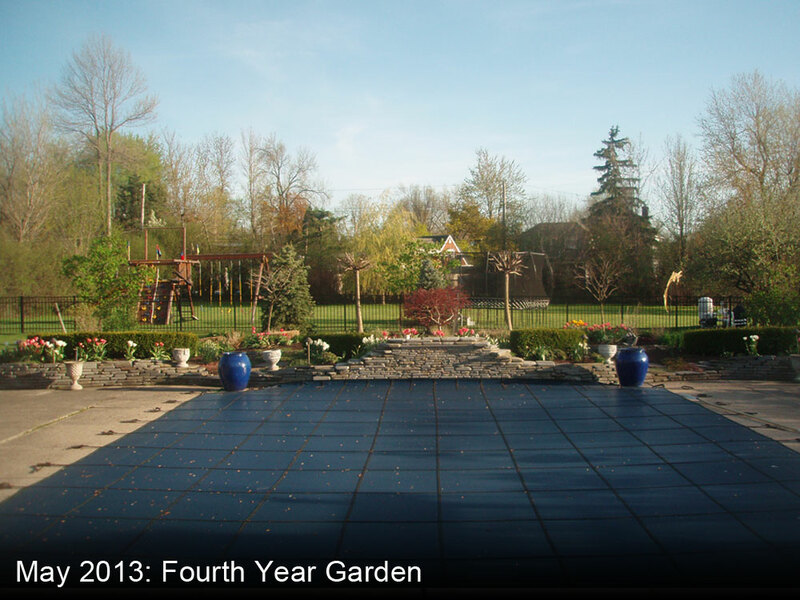 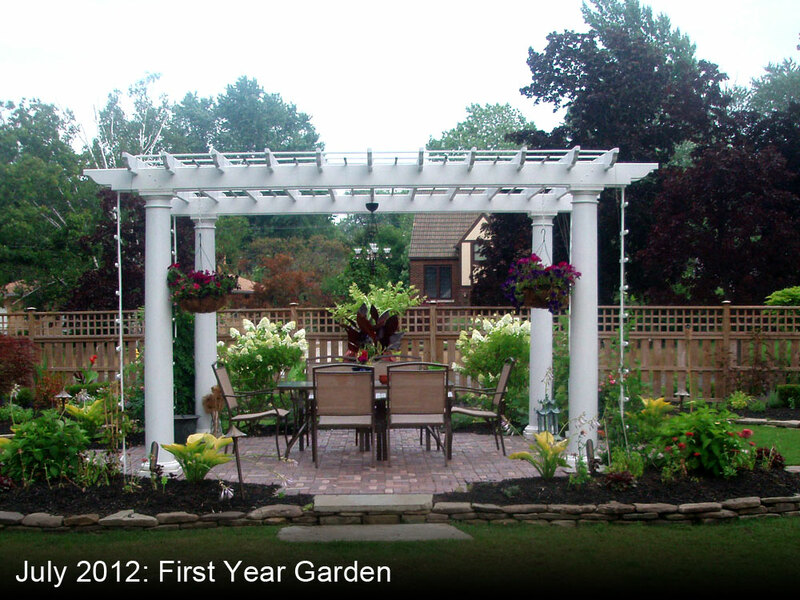 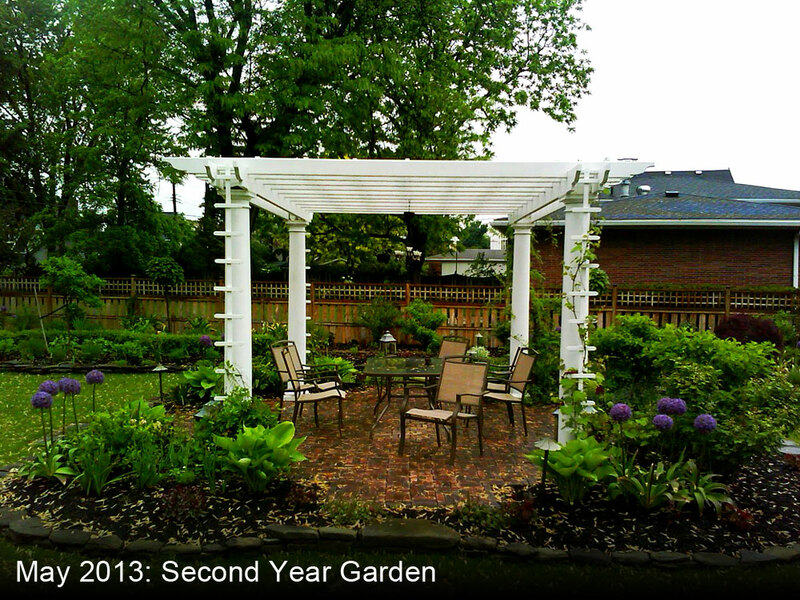 Phase two included creating new patios, and then six years after beginning the transformation, a White Garden was planted on the side slope which has matured nicely. 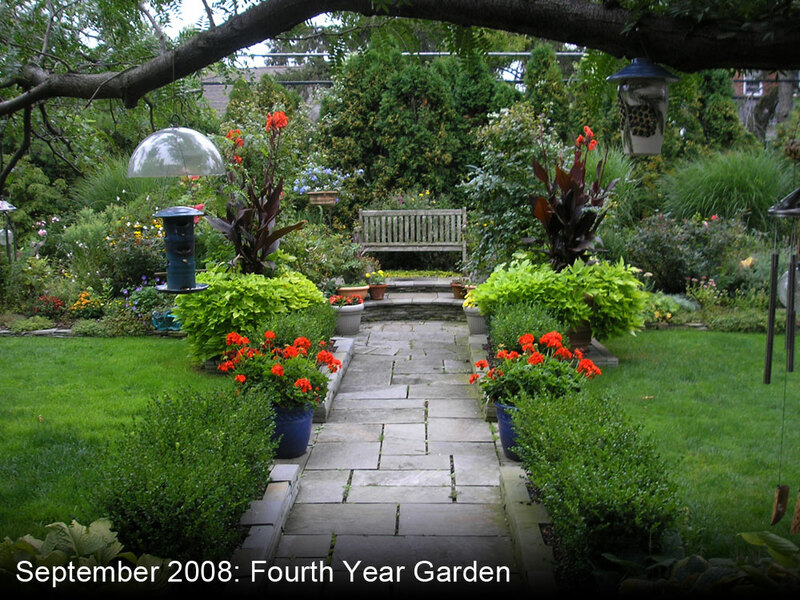 Originally a Victory Garden during World War II, the land was transformed into a beautiful garden, the scale of which is unusual for a private residence. 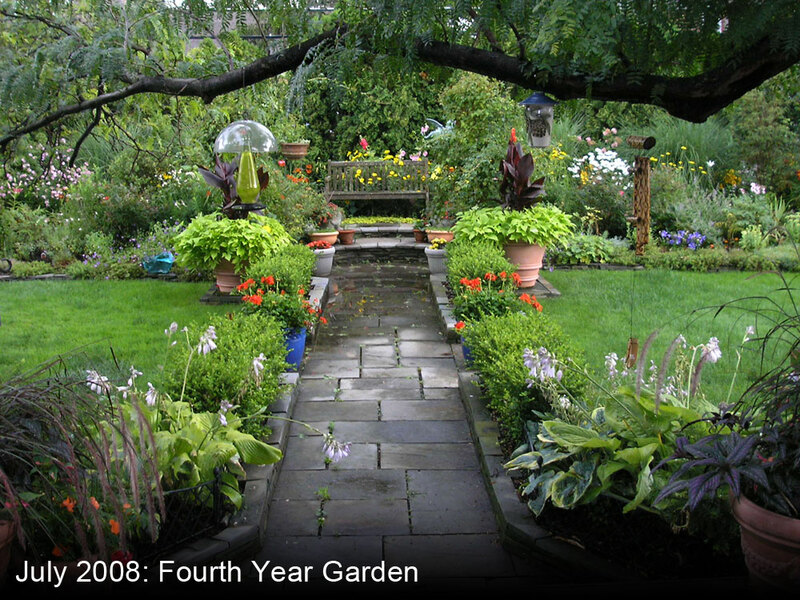 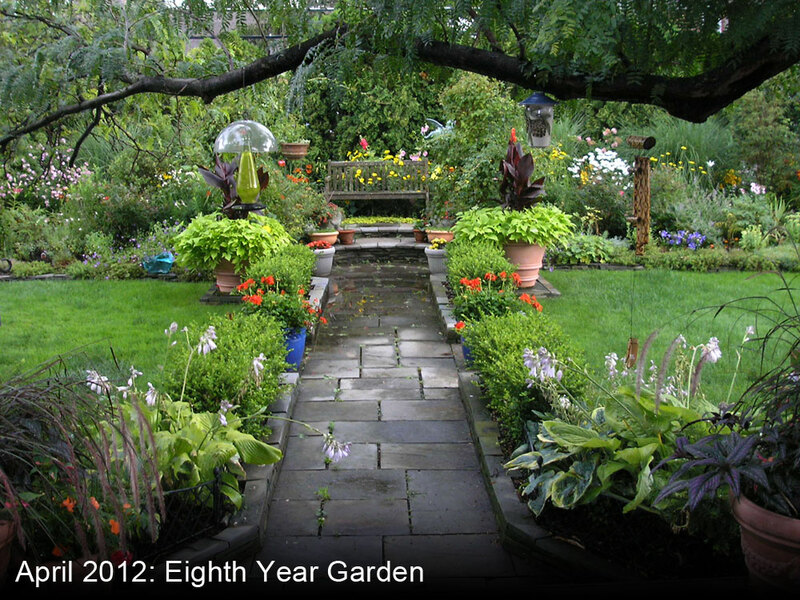 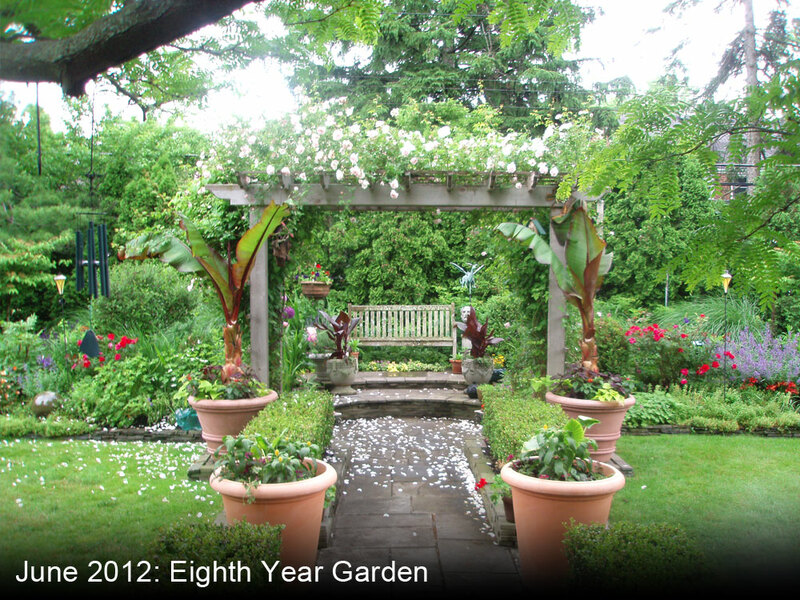 The garden enjoys a sequence of blooms, vertical elements, destinations and focal points from multiple views and low-maintenance design considerations. 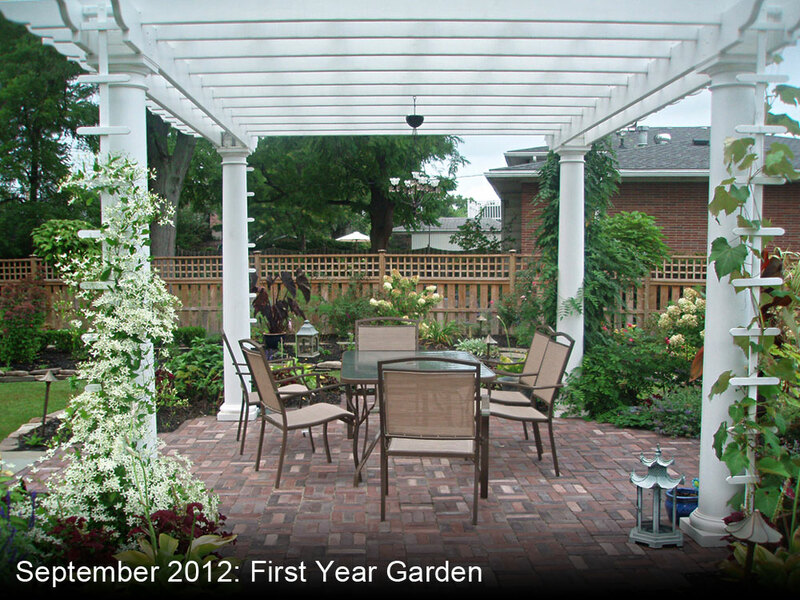 The hardscape elements include a lattice-top wood fence around the perimeter for climbing vines, a classic brick paver patio under a white pergola with copper accents, a flagstone stepping stone path around the garden, natural stone garden walls and a potting shed. 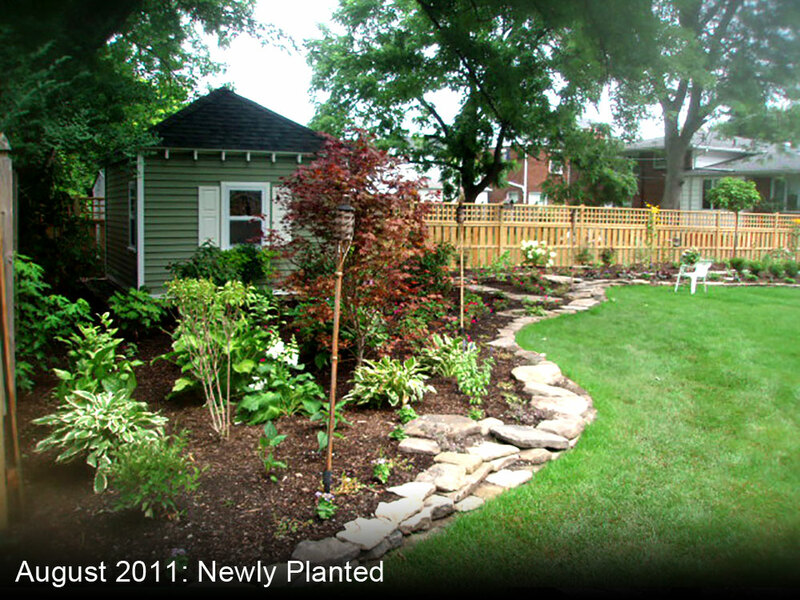 The most recent addition is a geometric raised vegetable garden. 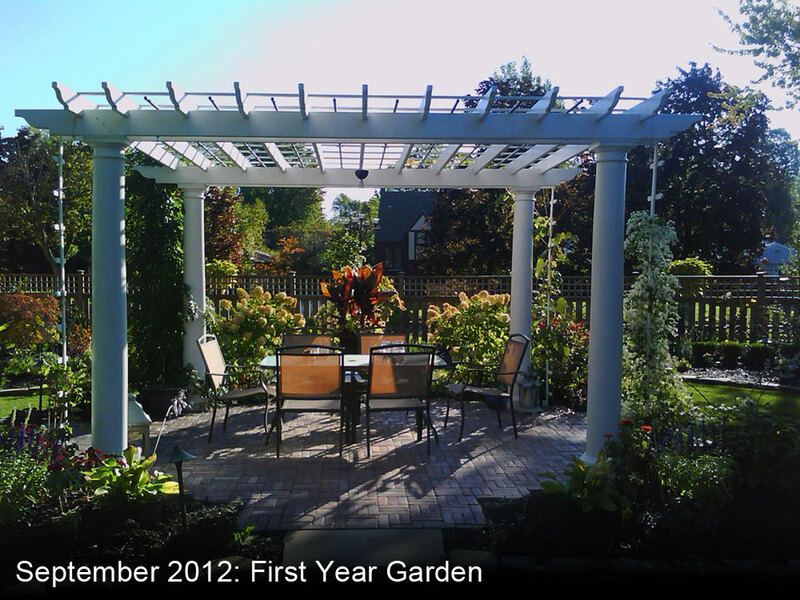 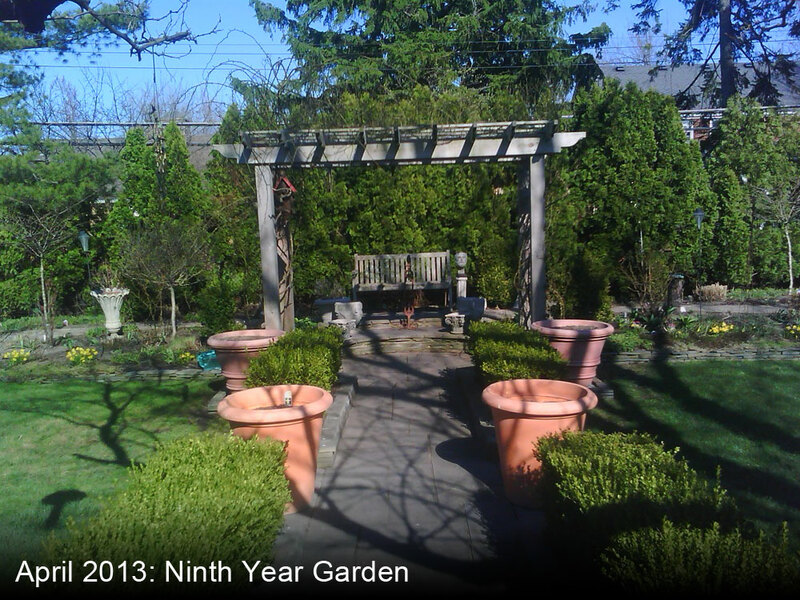 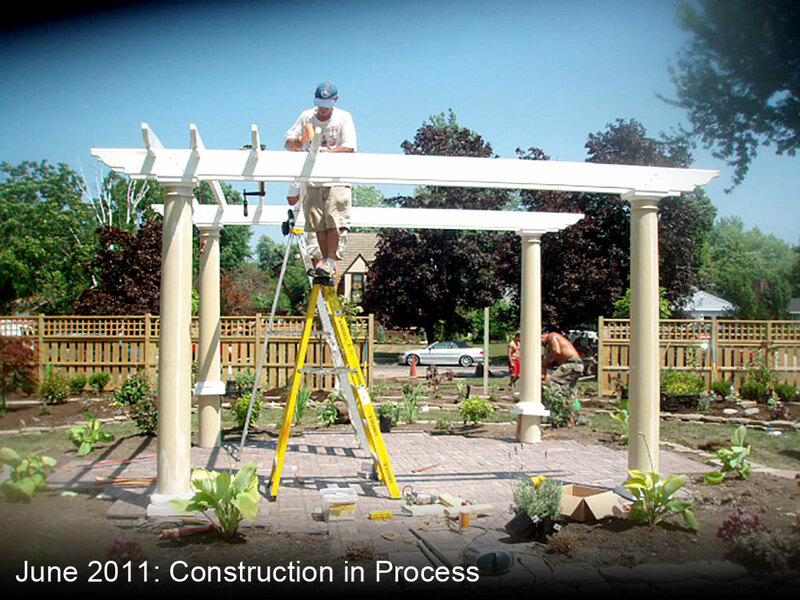 The garden design for this classic English garden began in 2004, with three major phases of construction: the first year saw the introduction of perennial flower beds and privacy plantings, in 2006 we added flagstone walkways and boxwoods, and in 2011 we installed a cedar arbor. 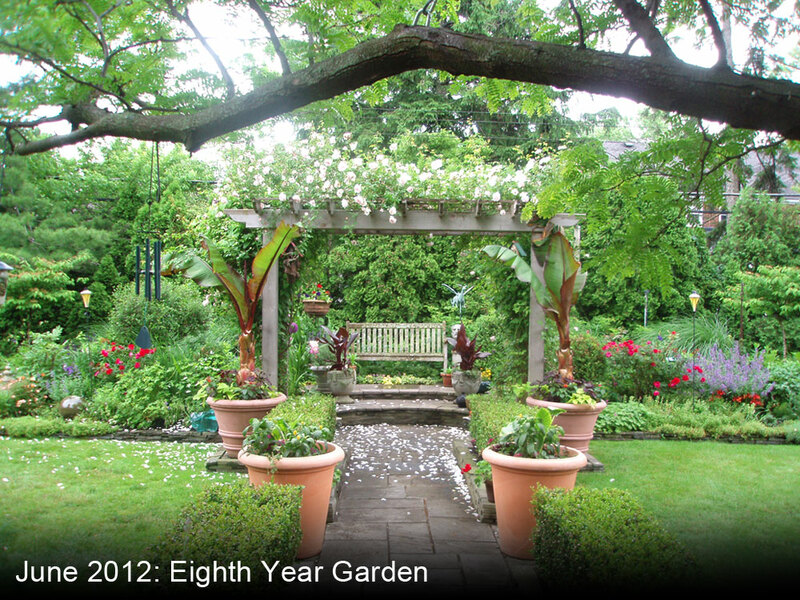 The garden includes a sequence of blooms with creeping phlox, viburnum, clematis, and New Dawn rose, tropical red bananas, alocasia, and asters. 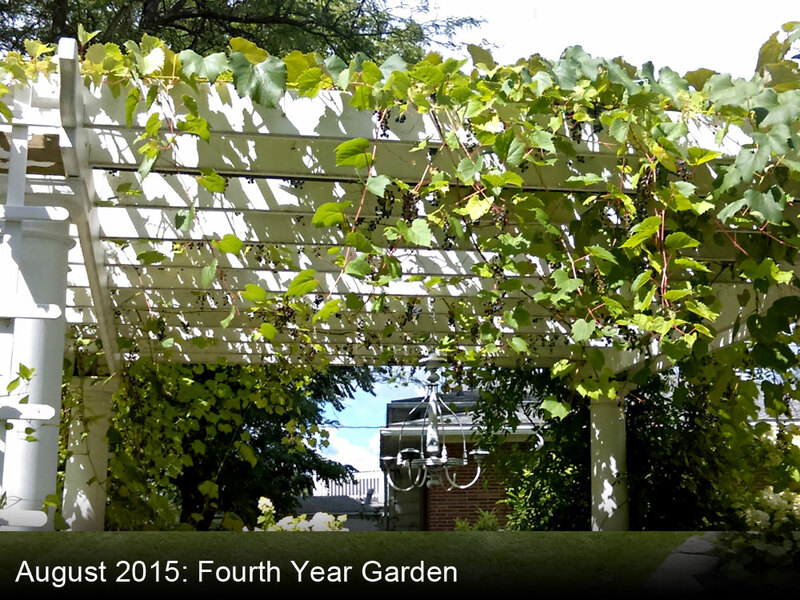 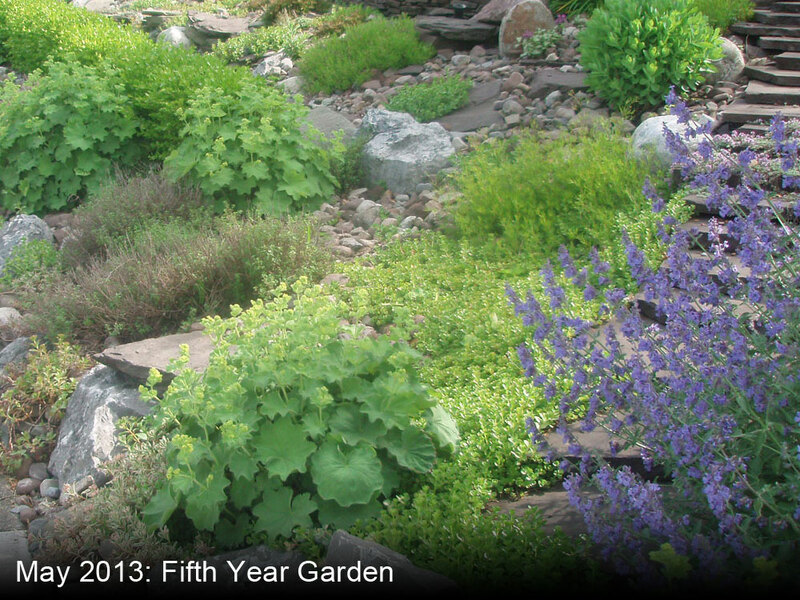 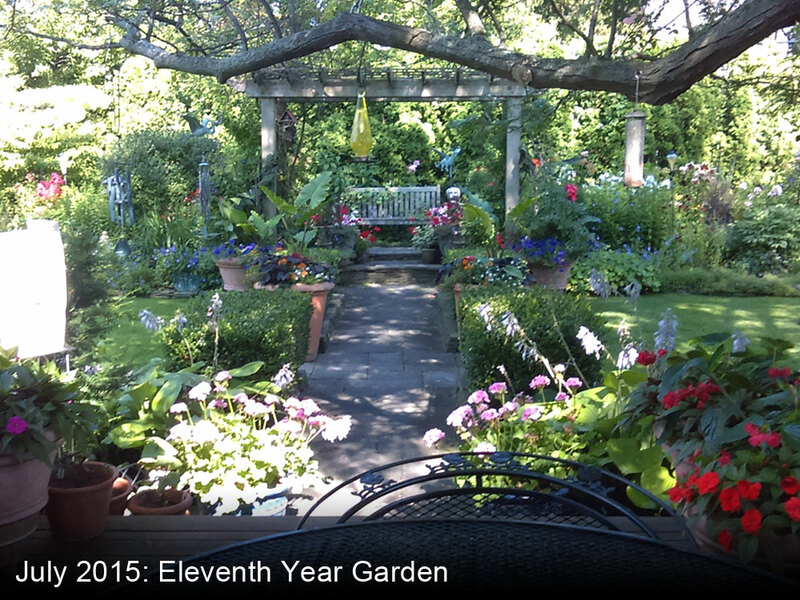 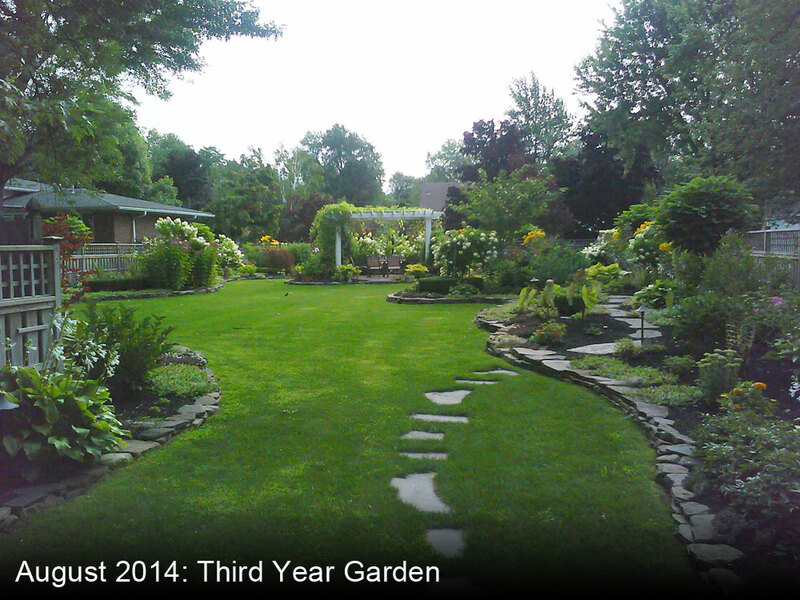 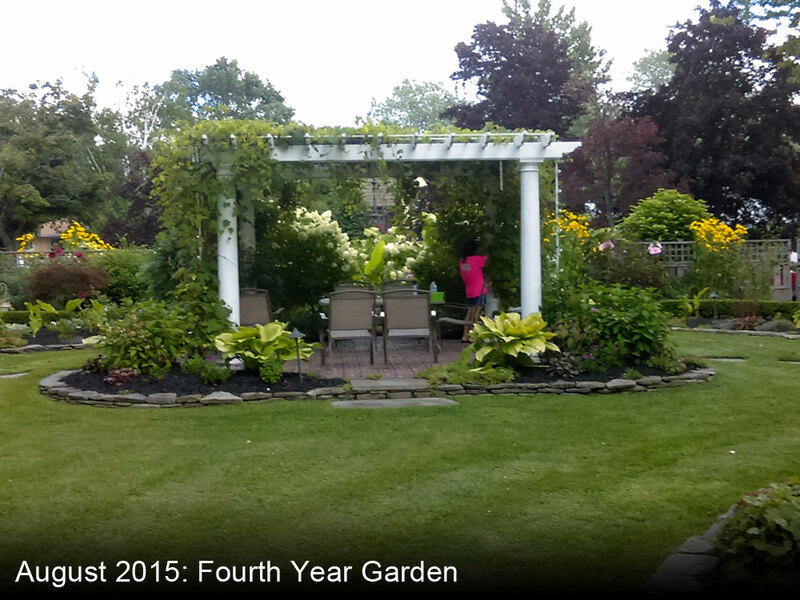 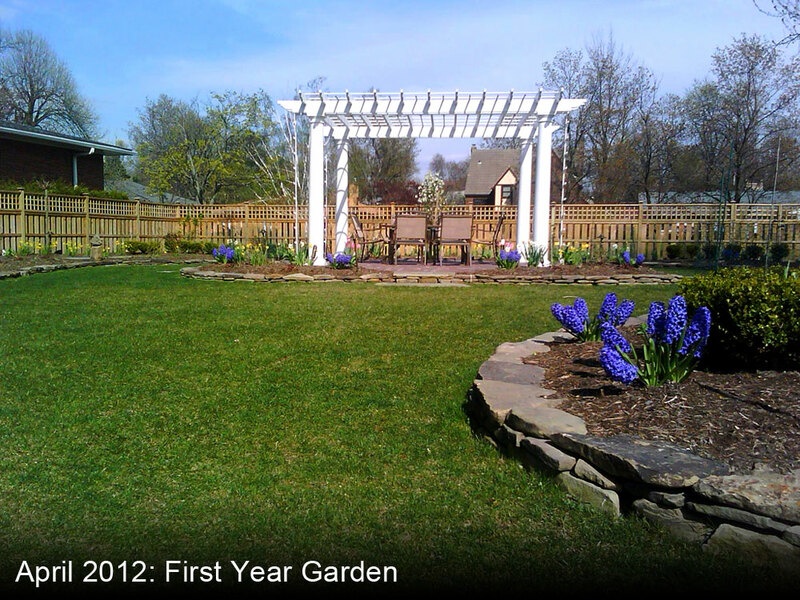 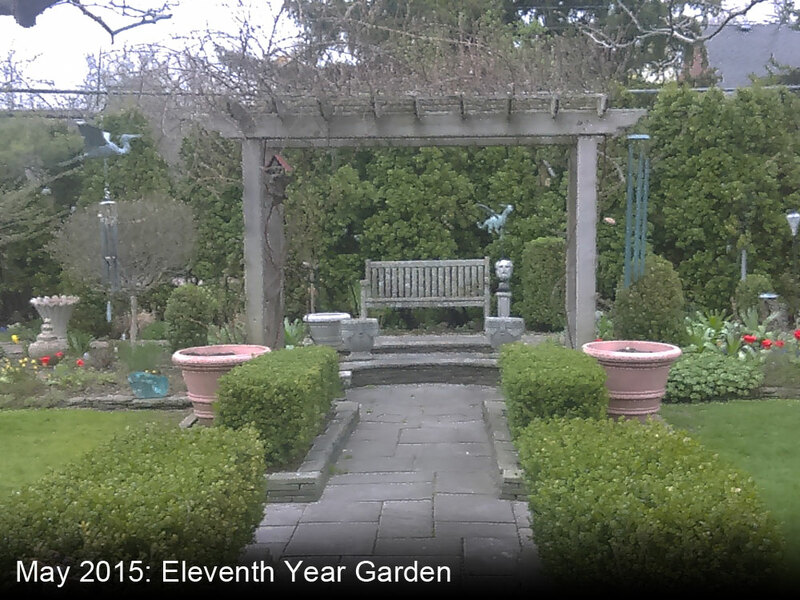 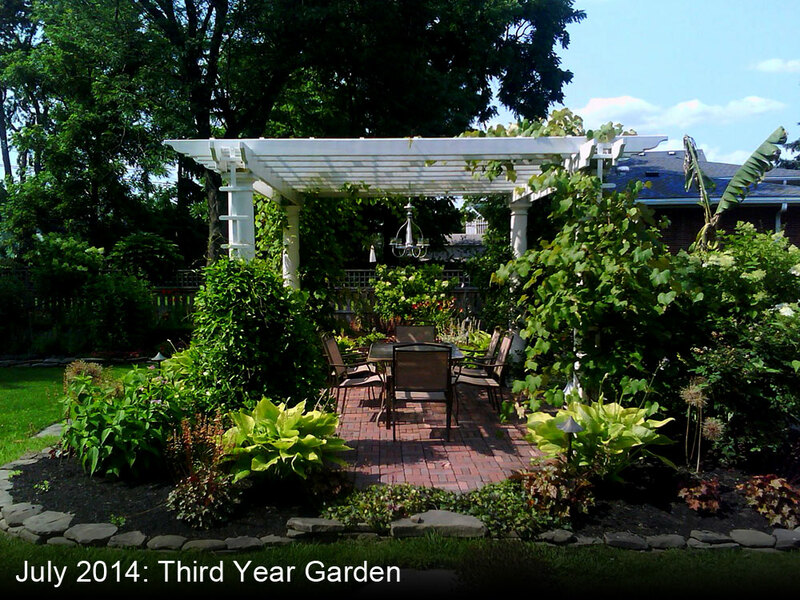 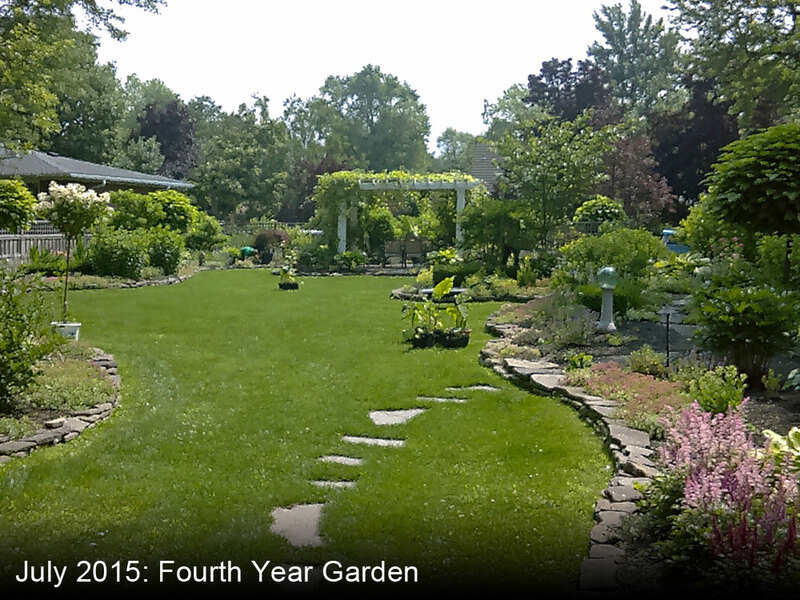 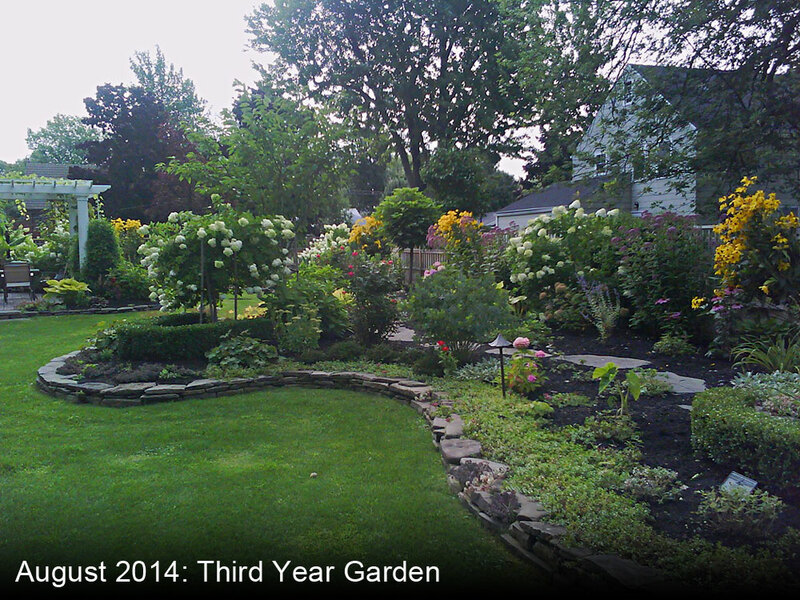 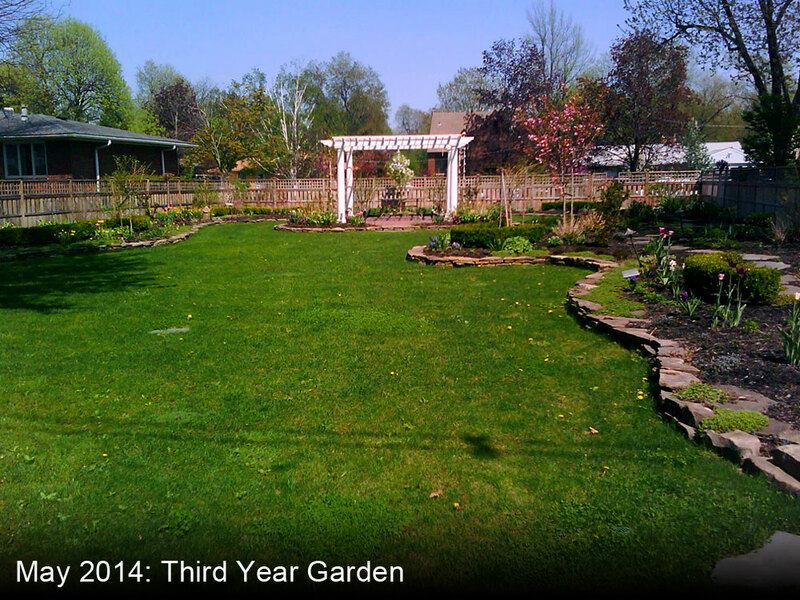 In 2015 we added a lilac planting; this is a perennial favorite garden! 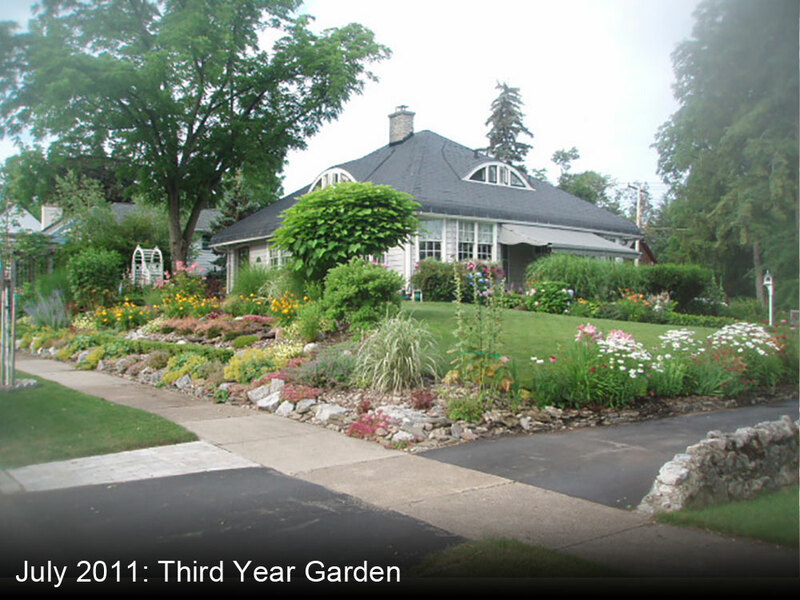 The front garden shows off every season with strong bones and wave after wave of color, but we’re featuring the back gardens where the owners relax. 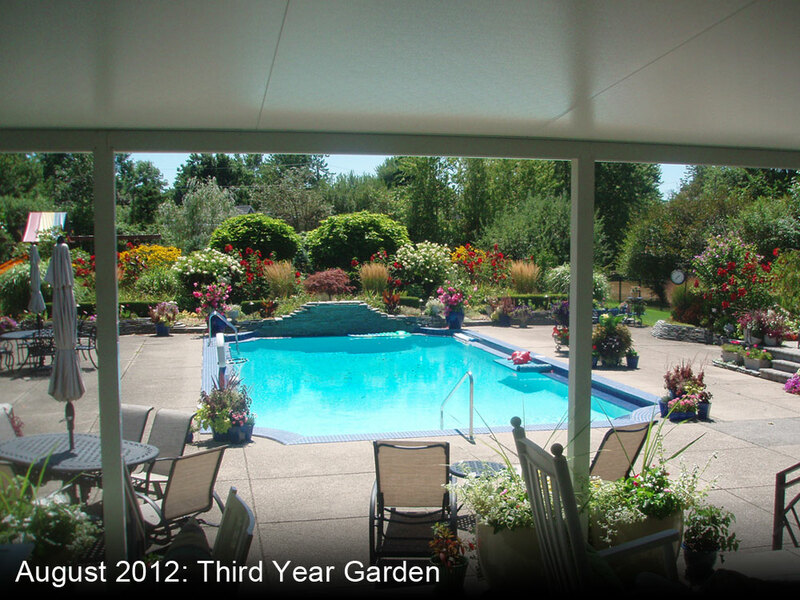 It has a pool and hot tub for grandchildren to enjoy as well as trampoline and playset.